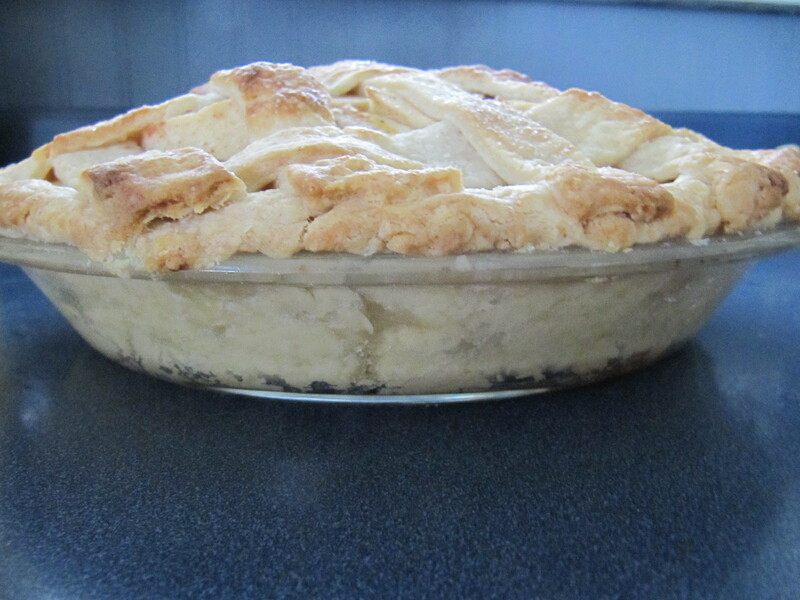 Along with this years Thanksgiving cheesecake (Skor – which was not awesome) I made Apple Dapple Cake. To me Thanksgiving just screams apples and cinnamon, it seems to be a fall thing. 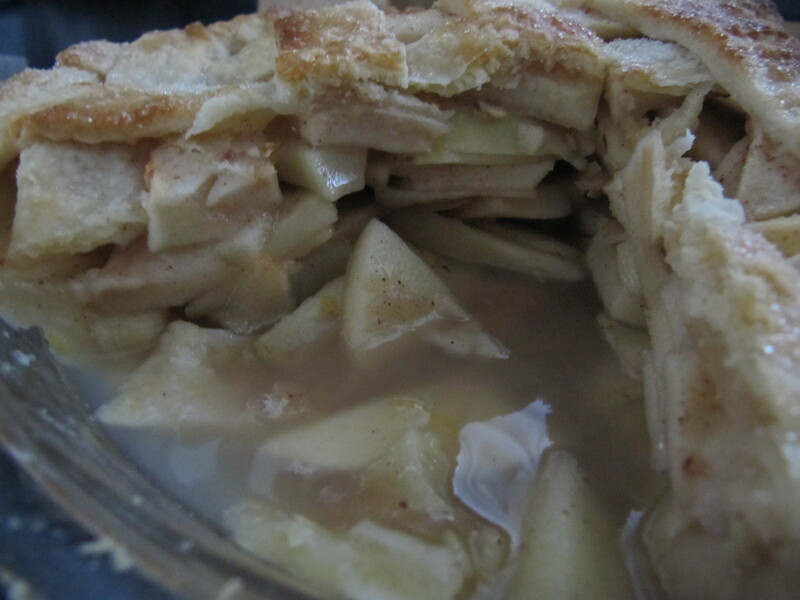 With my horrid past in pie making, I thought I would take a different approach with an apple dessert. I found this recipe on Pinterst, it is from Southern Plate. Great website, check it out. When I saw all the photos I knew I had to try it. 3. Mix oil, sugar, eggs and vanilla. 5. Add to first mixture. 6. 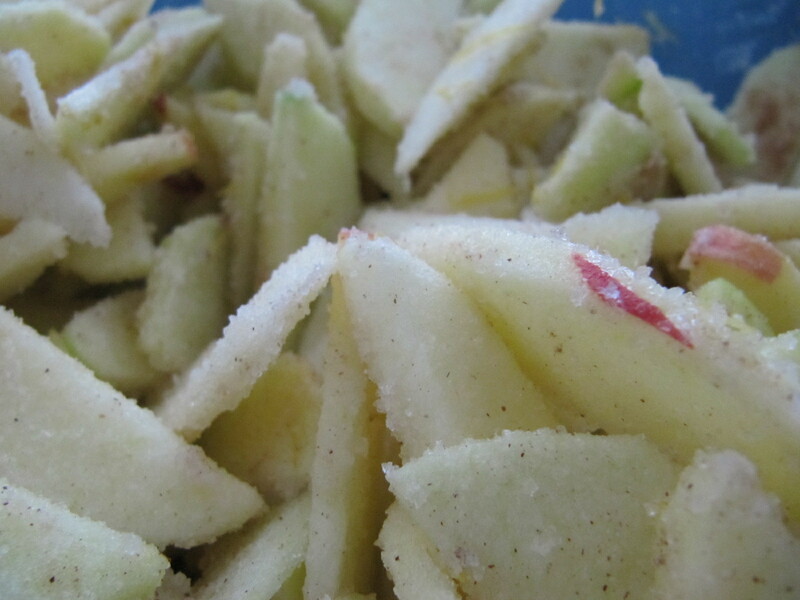 Fold in pecans and apples. 7. Bake in tube pan at 350 for 1 hour. 2. 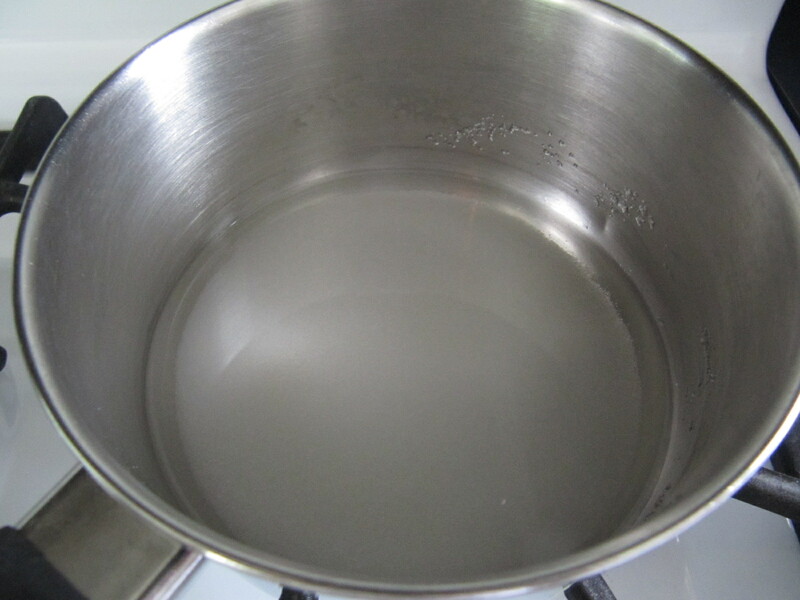 Bring to a gentle boil for 3 minutes, stirring constantly. 3. Pour over hot cake while cake is still in pan. We tried the sauce once cooled a little from the pot. OMG! Forget the cake, just make the sauce and eat it with a spoon. Heavenly! Let cake cool completely before removing. Everyone said they liked it, but I didn’t. I was quite disappointed, only finished a couple bites. It was quite dry and flavourless. I thought it would be moist and almost gooey with all that sauce that soaked in. Nope, heavy, dense, blah! Another pie, this is the 3rd in 3 weeks! I know, I have went on and on, in the past, about how I hated making pies. 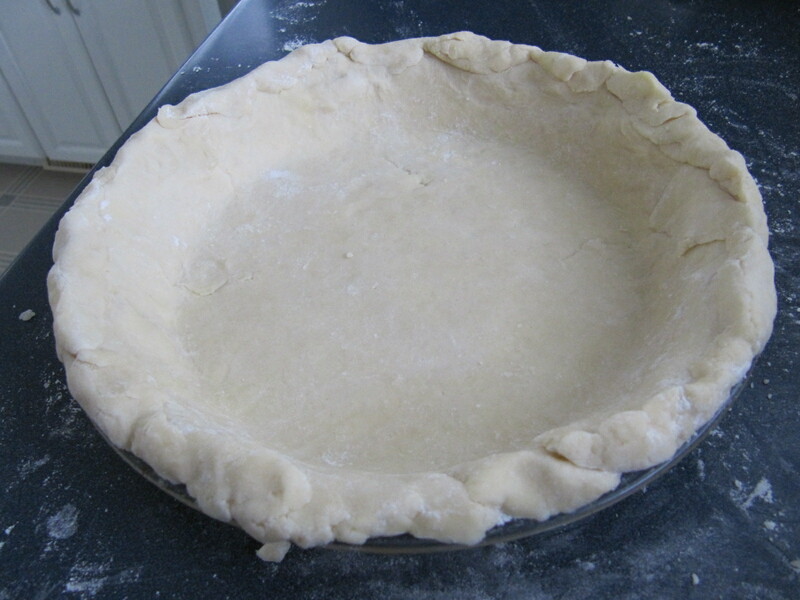 Since then I have learned how to make a good crust, that seems to work out every time! 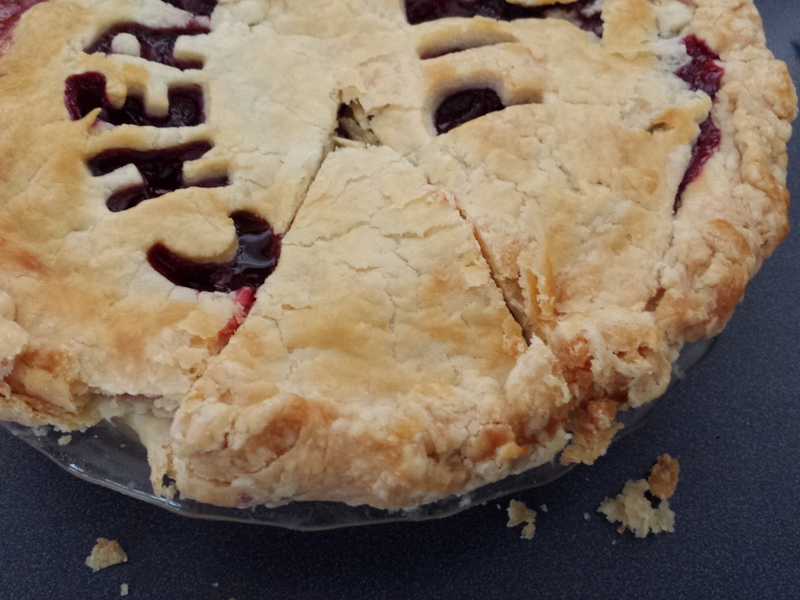 Everyone else in my family loves pie so they are always eager to try something new. 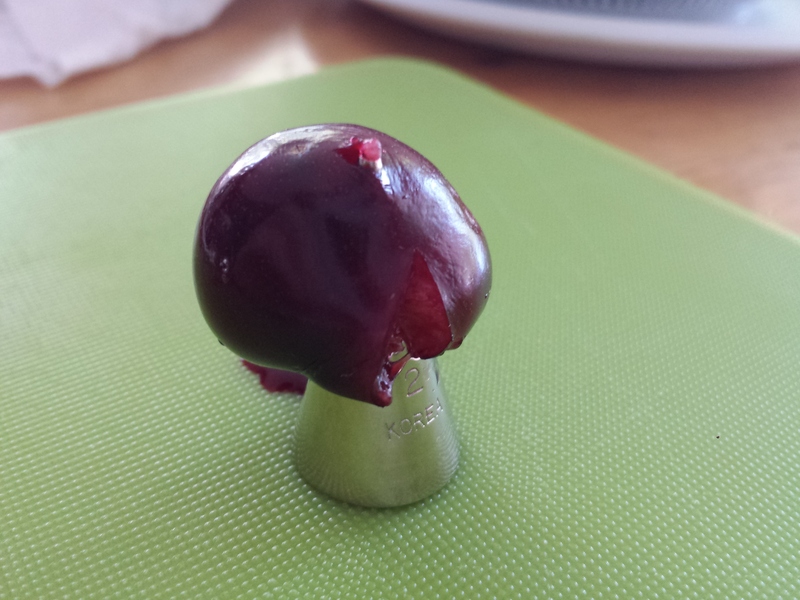 This time I wanted to make a cherry pie. 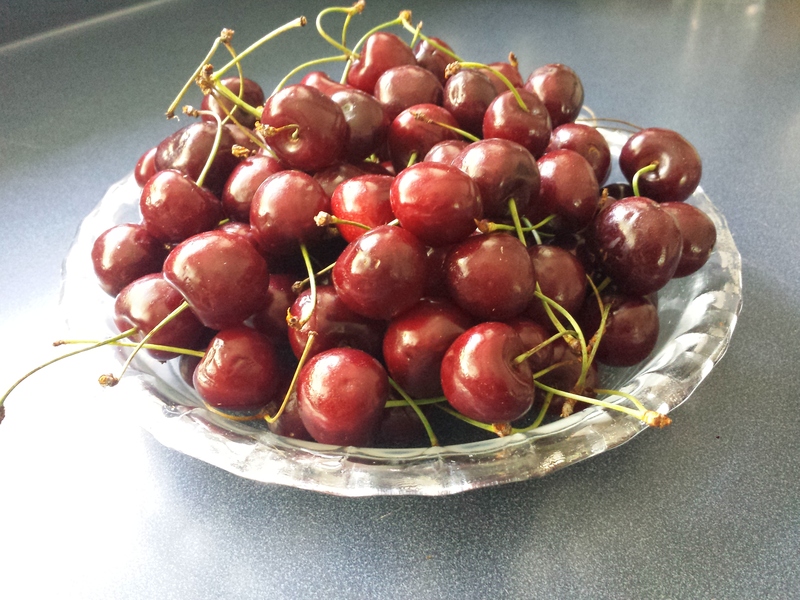 The cherries are amazing this year and I figured I would give it a try. 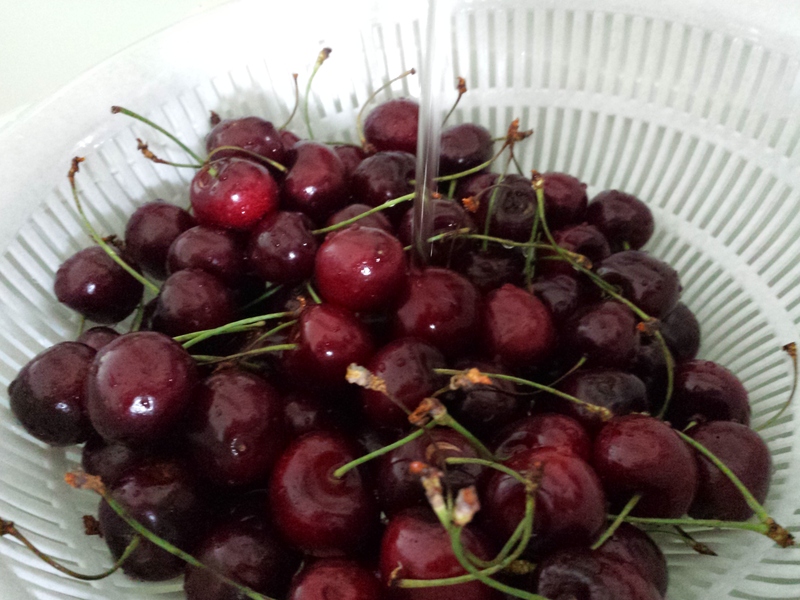 After buying and extra basket of cherries everyone told me, ‘you can’t make cherry pie with those cherries!’ What?!?! 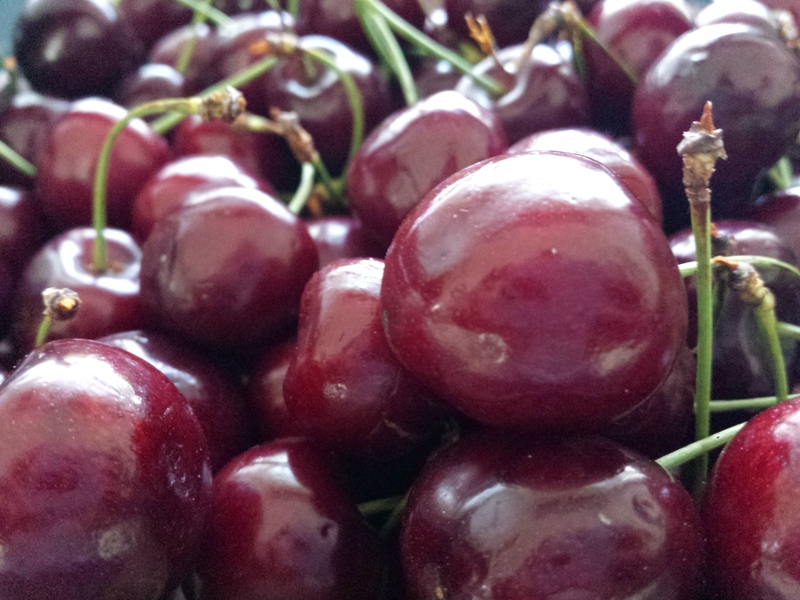 To me a cherry is a cherry, beyond the fresh ones at the market and the maraschino ones you get in the jar I really didn’t know there were more. Apparently there are. 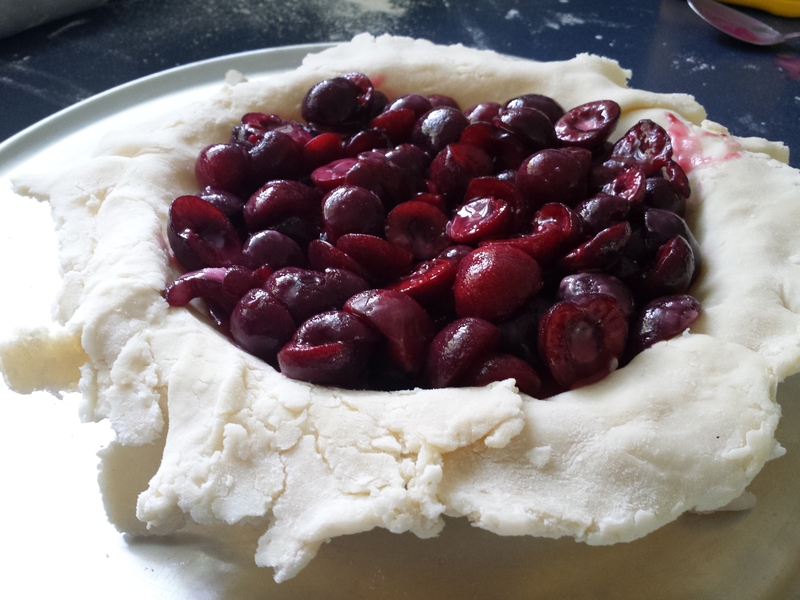 Rumor is that you can ONLY make a pie with sour cherries. 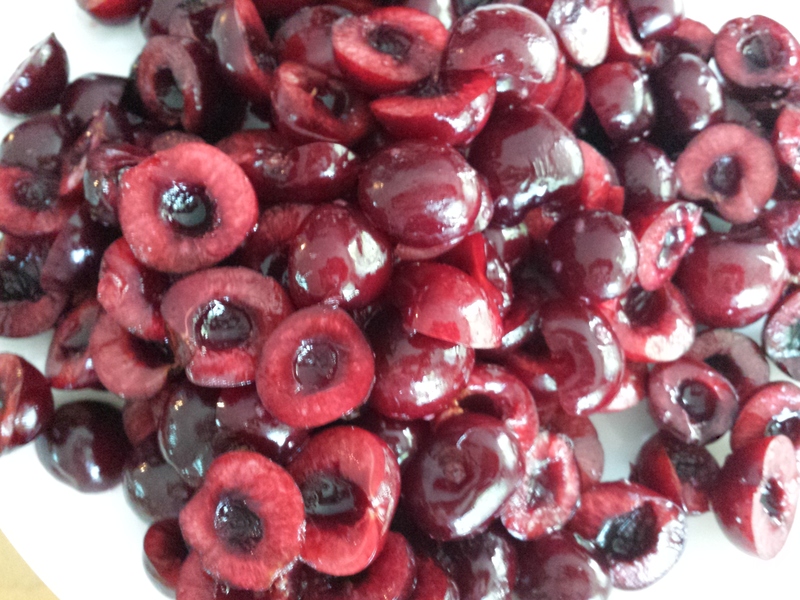 At this point I am a little flustered as I have no idea what I am going to do with all of these cherries! 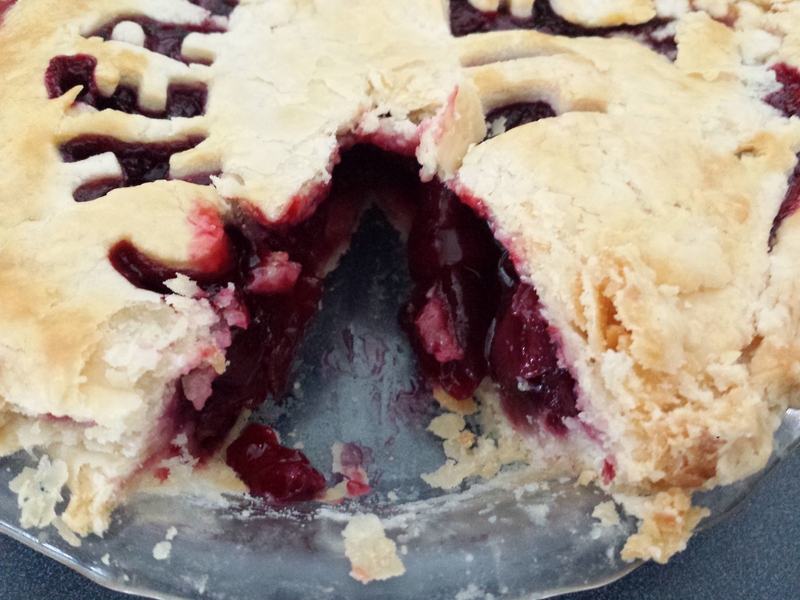 When I got home I take to the web in search of some baking answers, “can you make a pie with sweet cherries?” YES, YES you can!!! 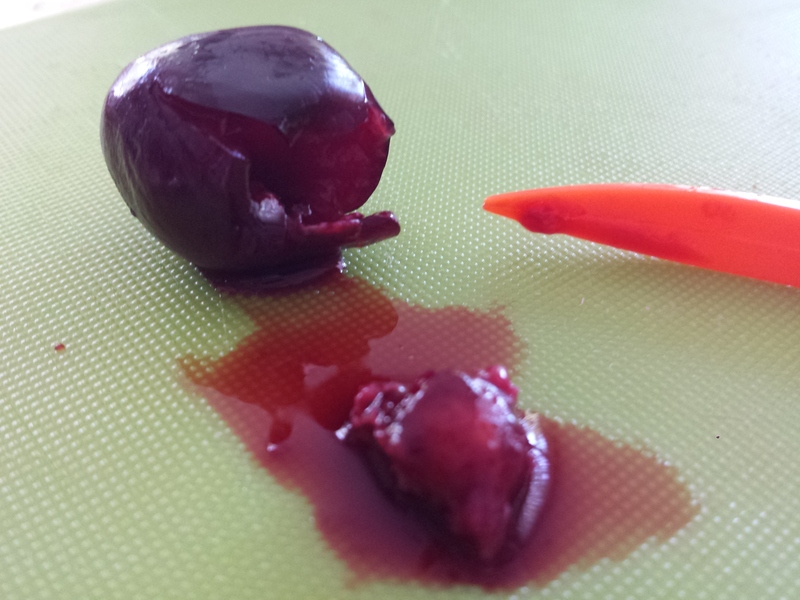 There were tones of recipes out there, also tones for the sour cherries. I’ll show them!….I hope…. This one I did follow a recipe, with so many people rooting against me I figure I better follow something! 2. 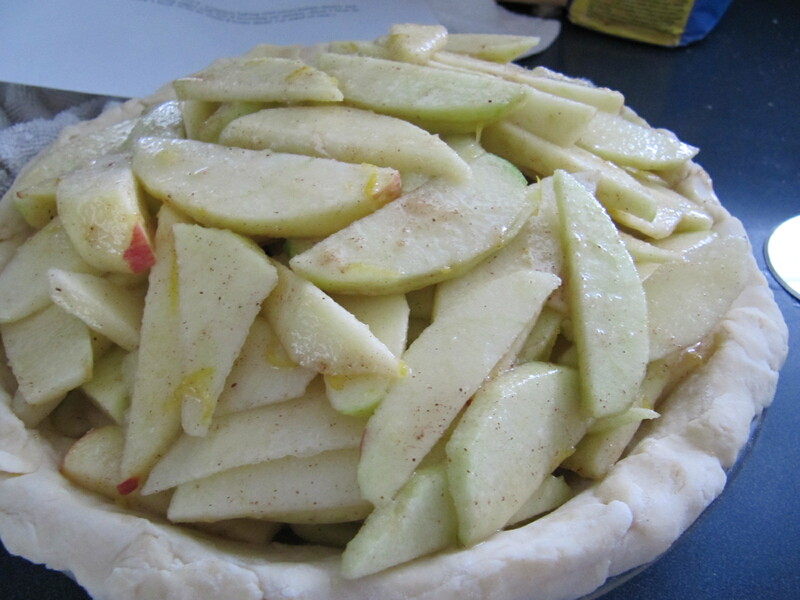 I never know how much fruit to use and many of my pie dishes are different sizes. 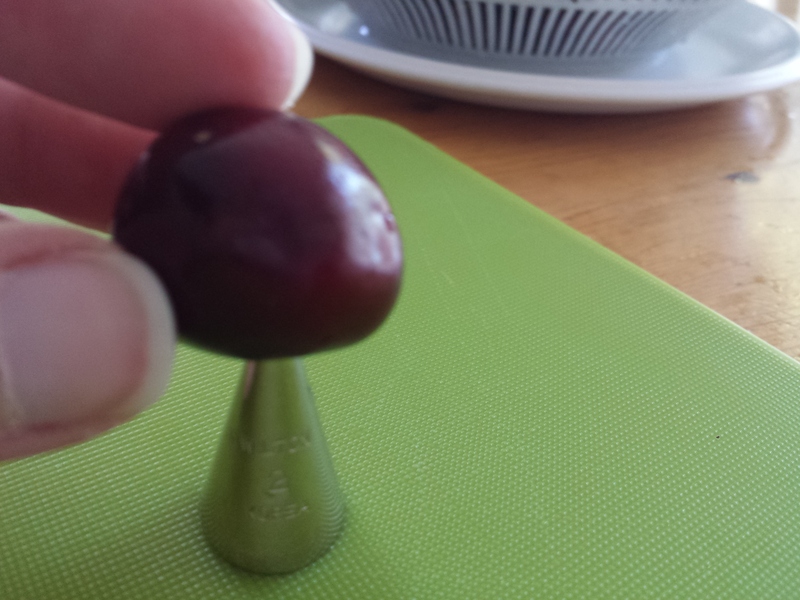 This is how I measure how many cherries to use. This many! 5. 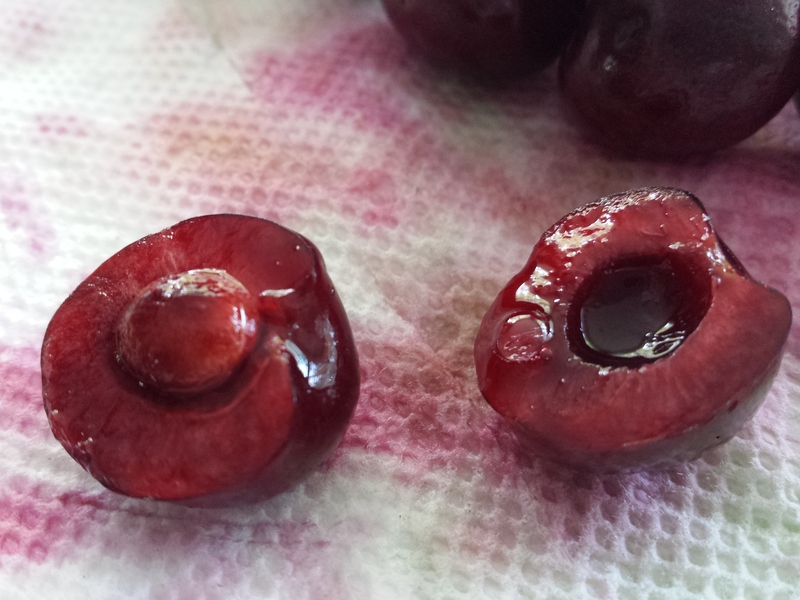 Stem and pit the cherries. This was something I had never done before. 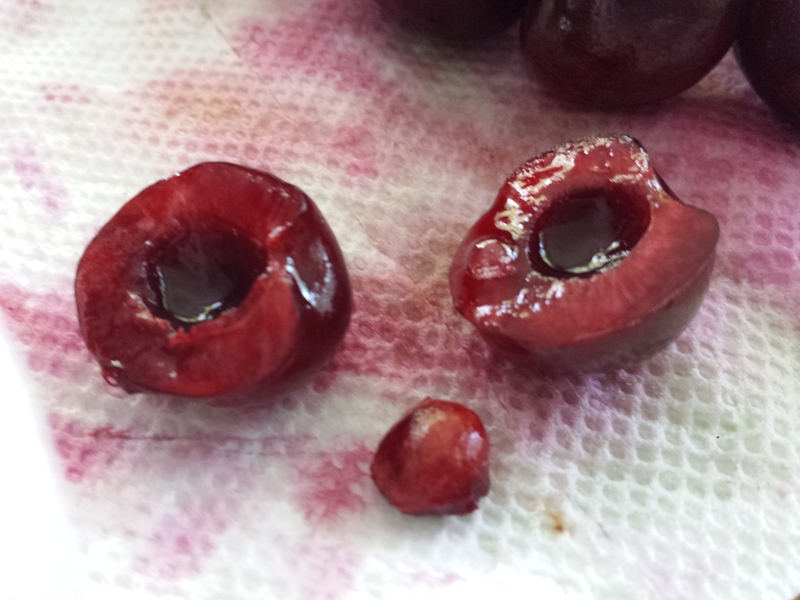 When I eat cherries I always just spit them in a cup (classy I know). As there were so many of them I looked up different ways of going about it. 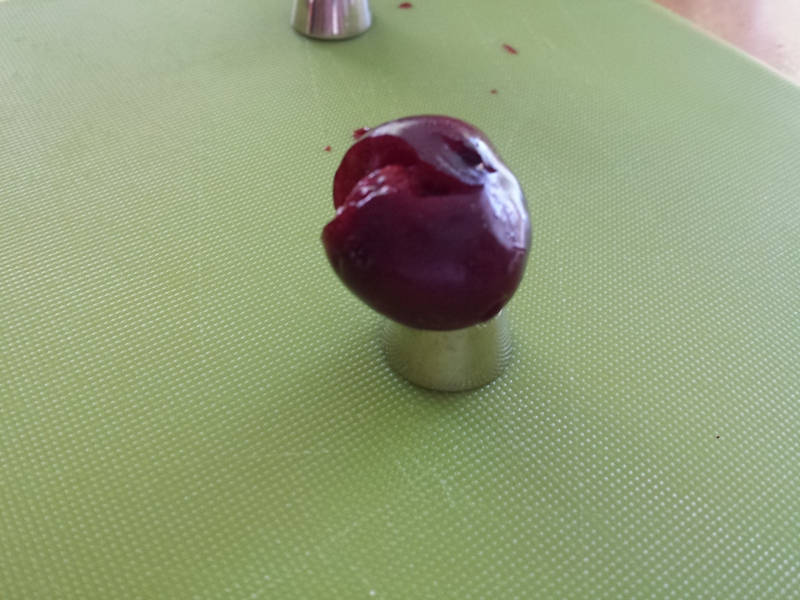 I was quite surprised to learn there is an actual cherry pitter! It’s quite the tool. As a gadget freak like myself I may look into it. 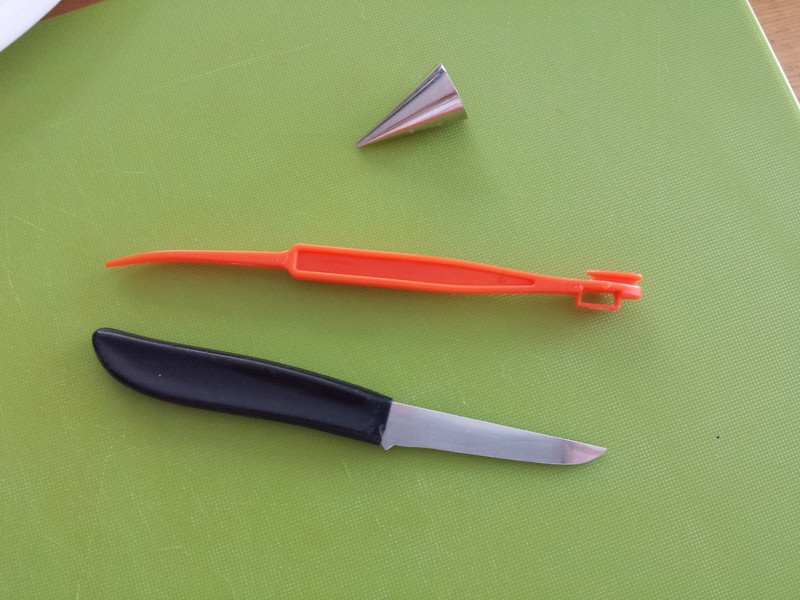 I settled on these 3, a knife, a piping tip and an orange peeler. They made it look so easy. 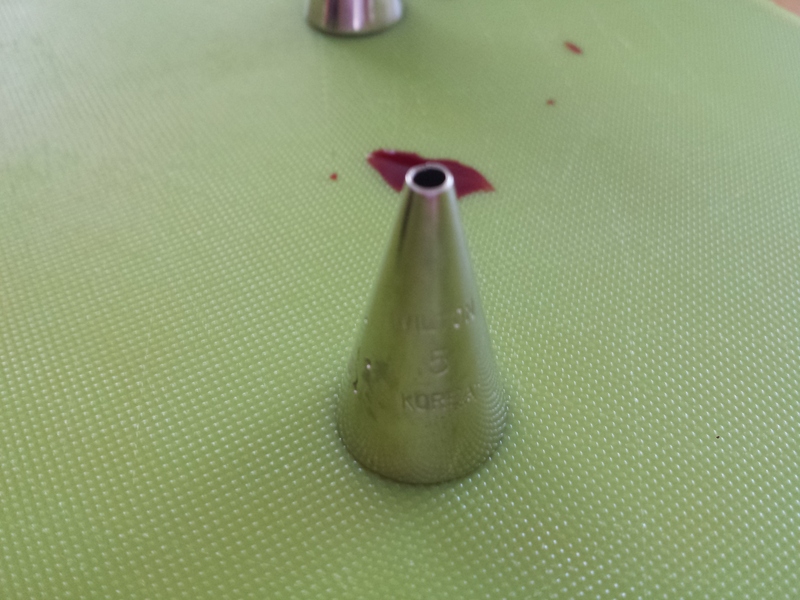 The piping tip seemed like the best option to me, made total sense. Plan C – My idea, a knife. I treated it like an avocado. 10. Bake at 400ºF for 15 minutes. 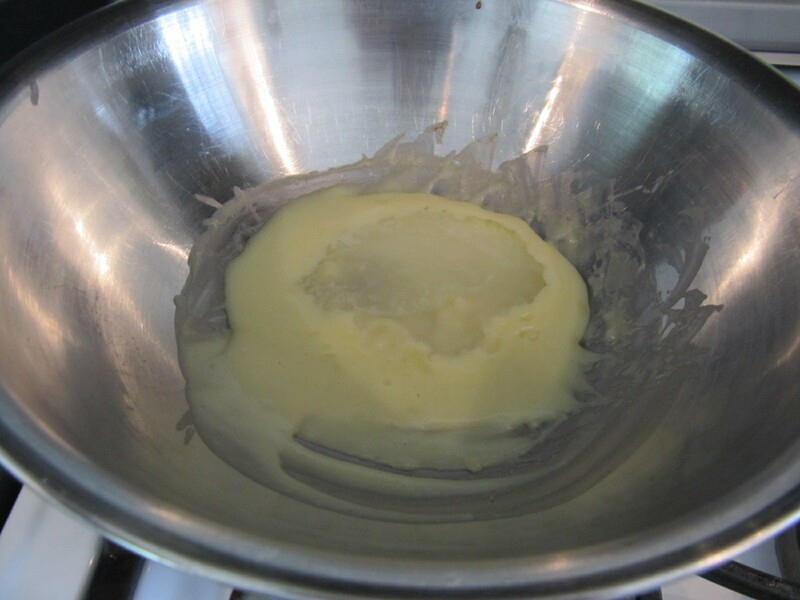 Reduce heat to 350ºF continue baking until golden brown and centre is bubbling. 11. 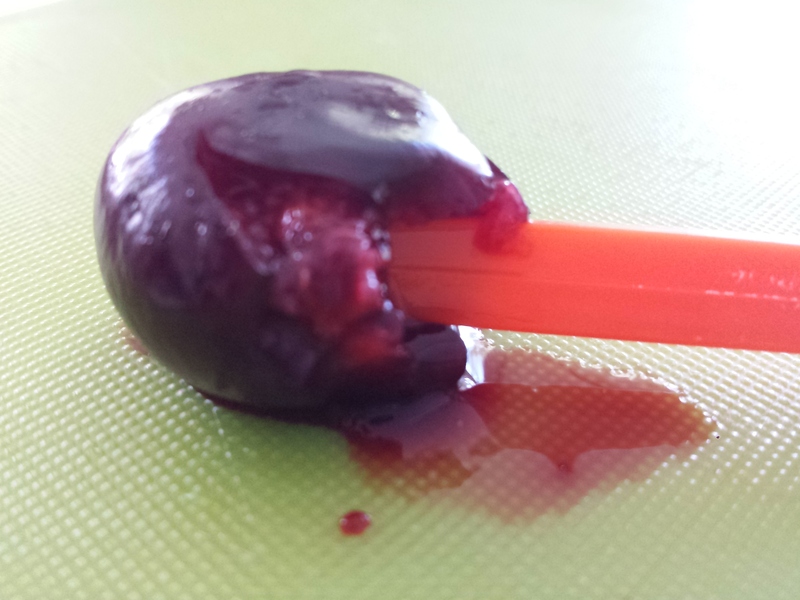 Allow to cool to room temperature before cutting. 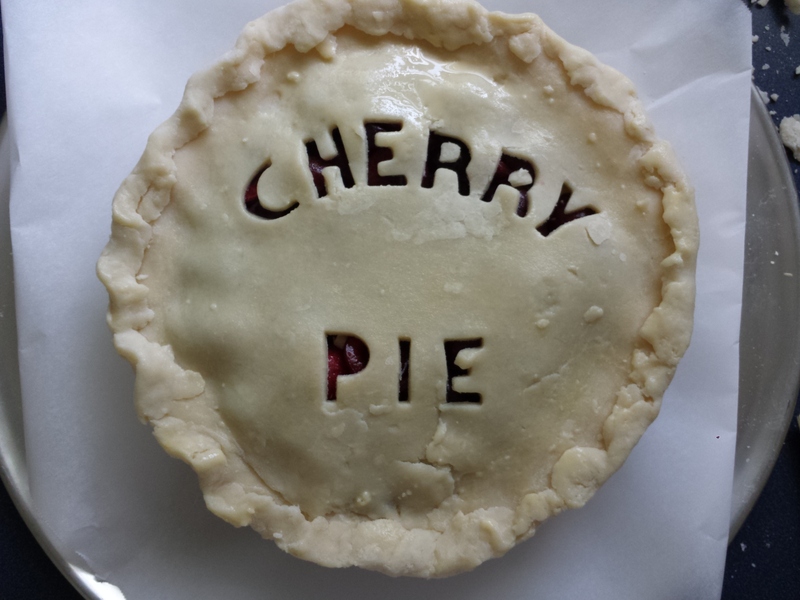 I am praying that the pie has set and I don’t end up with cherry soup! 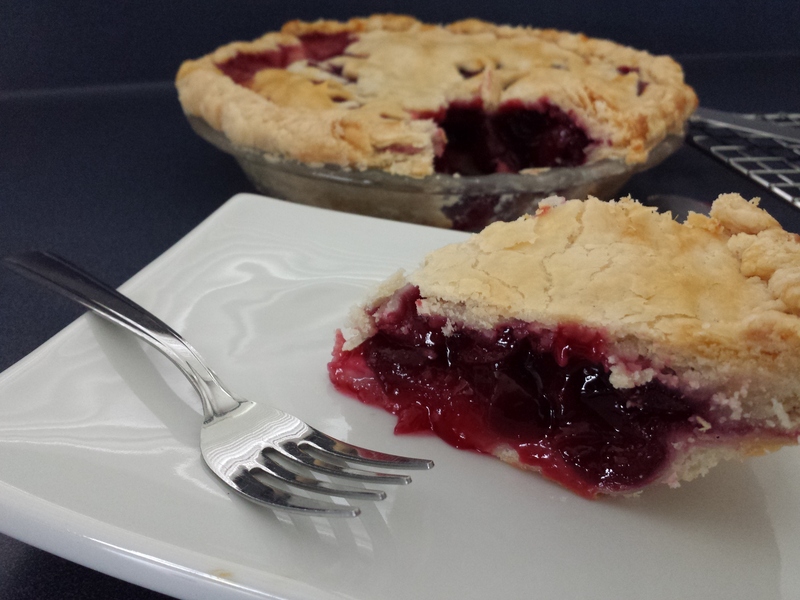 I would like to say YES you can make a pie with sweet cherries! 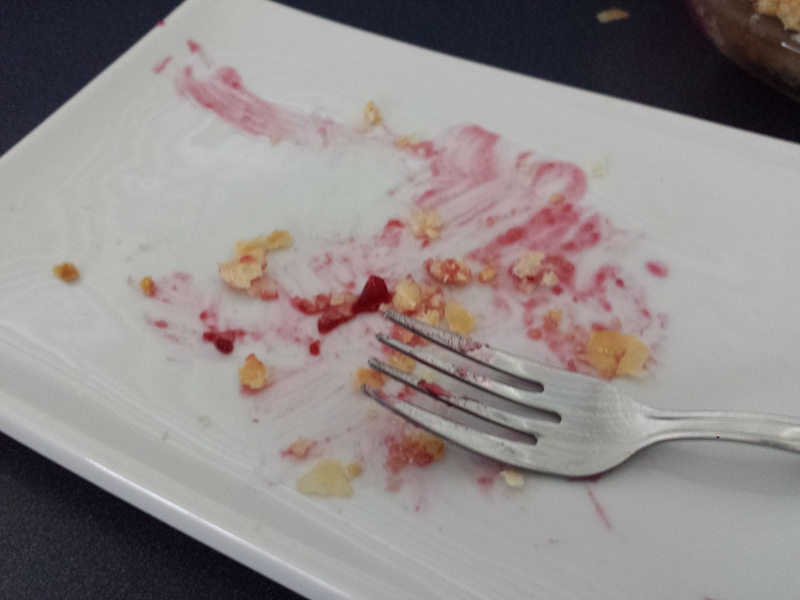 This pie was delicious! 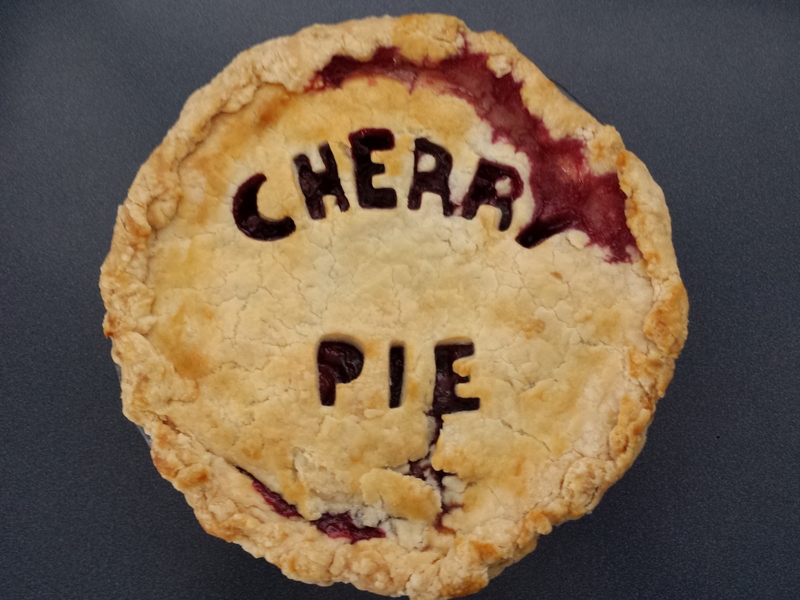 I’ll be honest, I have nothing to compare it to because I have never had cherry pie but I can’t imagine it any better. The crust was rich and flaky and the filling was delightful. Even though they were sweet cherries there was still quite a bit of tang, but not too much it was the perfect balance of sweet and tart. The pie set perfectly, a slight run but not soupy. I think I am getting the hang of this pie thing. I may, and that is a big may be converted to a pie person. I ate the entire piece! 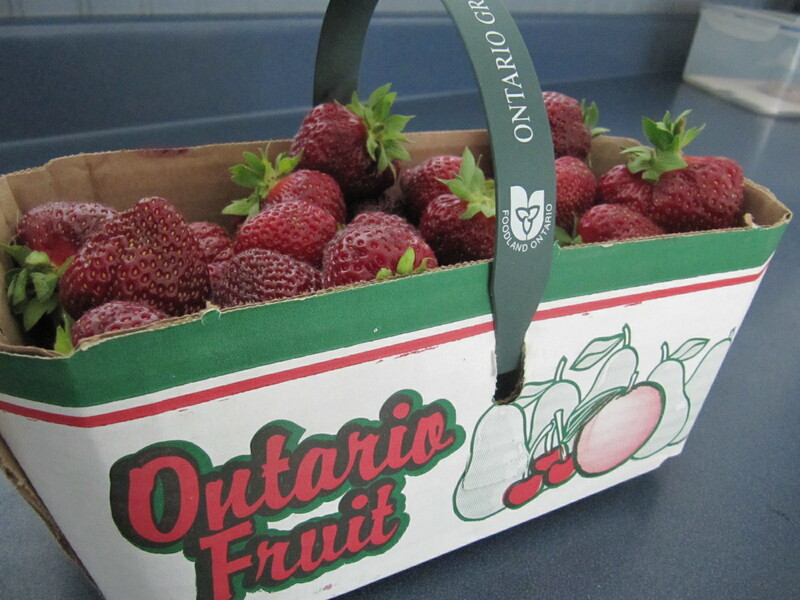 It’s one of my favourite times of the year, Ontario strawberries are ready for picking! 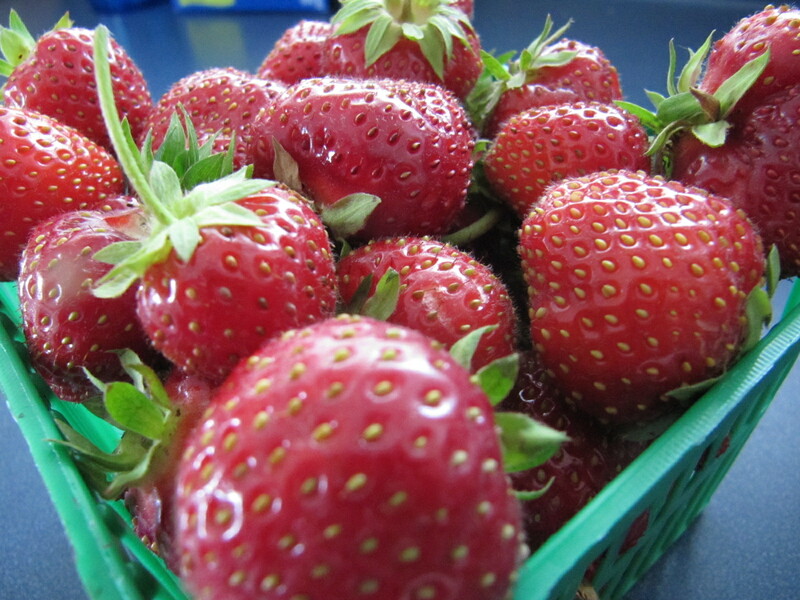 I love strawberries, but I really only eat them this time of the year, they are fresh, local and delicious! 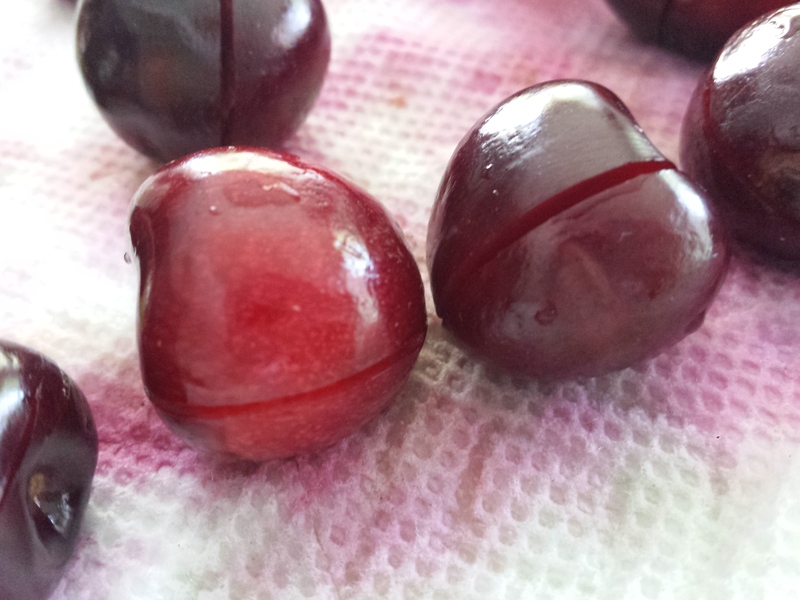 These berries are deep dark red all the way though, juicy and sweet. I hate when you buy a package of strawberries from the grocery store and they are only red on the outer 3 millimeters and the insides are white and have no flavour, ewww! 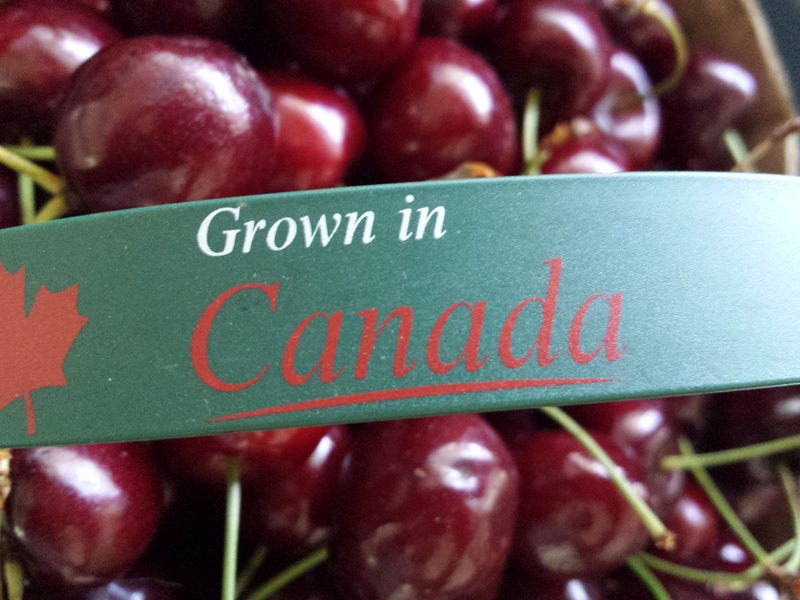 I tend to eat as many as humanly possible for about a month, while they are fresh right off the plant. When they start to peter off I buy more so I can freeze them and either bake with them in the winter or throw them in my smoothies. I normally just eat them as is, washed and stemmed. Sometimes I will put a little CoolWhip or yogurt on them, but I love to enjoy them in their natural form. Today I was in the mood to make something, BUT it is 33° C and feels like 38° C so I really didn’t want to turn the oven on to heat it up any more in here. 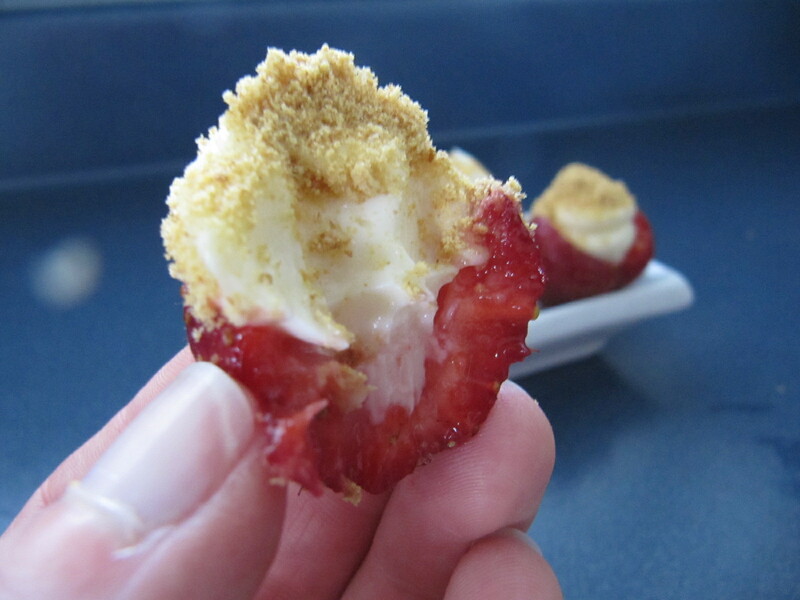 I looked up a few recipes (some of which I will making very soon) and saw a picture that reminded me of a recipe a friend told me about a while ago, Strawberry Cheesecake Bites. I didn’t have an exact recipe (which is killer for me, I am a strict recipe follower! ), but I thought I would be adventurous and give it a whirl, and make it up. 5. Sprinkle with Graham crumbs and enjoy! 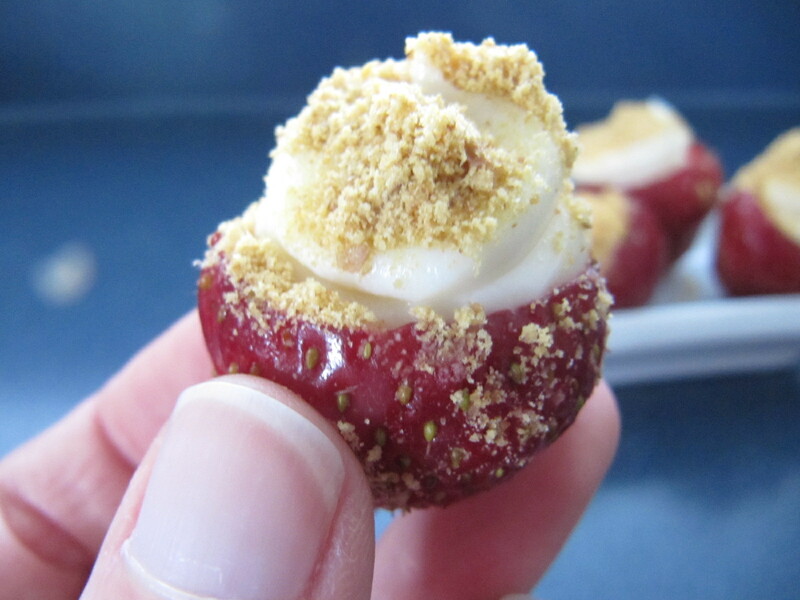 These little bite sized ‘cheesecakes’ were amazing! They were refreshing and a tad bit sweet, but not too much. They were excellent on a hot day like today. 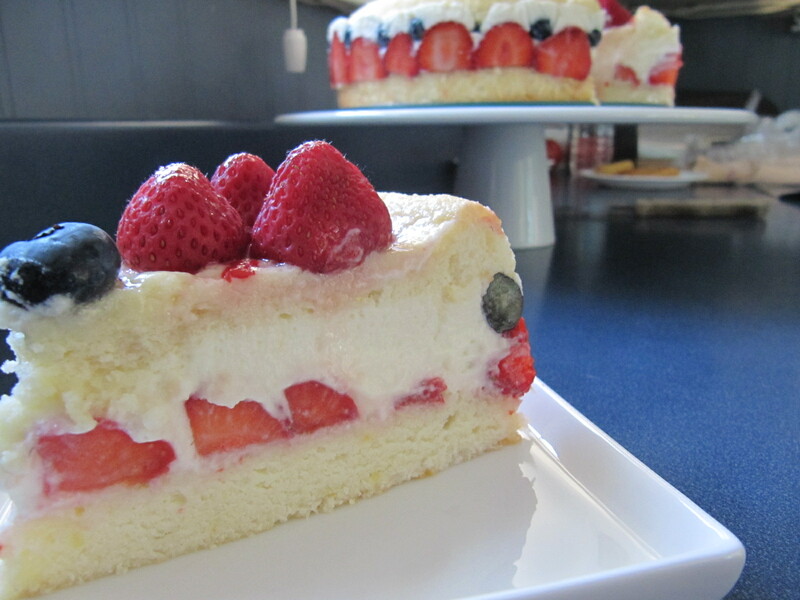 The sweetness of the berry and the creamy filling worked perfect together. The sprinkling of crumbs really brought it together, added a little texture. They really tasted like cheesecake. 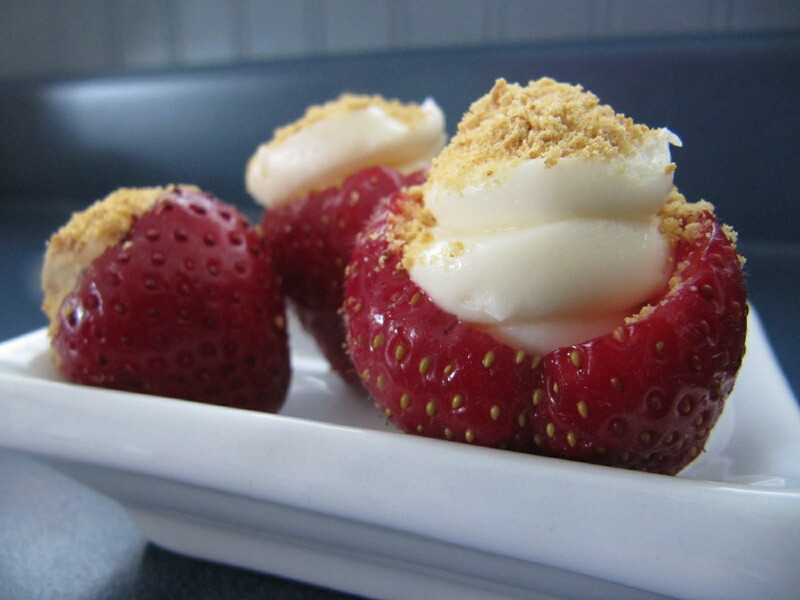 This is a wonderful light dessert all the taste without all the guilt of a real cheesecake. I will definitely be making these again. The Crazy Cooks are back! I joined the group a few months ago only to find out, after my first challenge, they were no longer going to be running. Then, last month I got an email saying that they were starting back up again!! I was quite excited as I only was able to participate in one previous challenge. This group picks a theme and you can find any recipe you want, but it must be a recipe you have never tried. 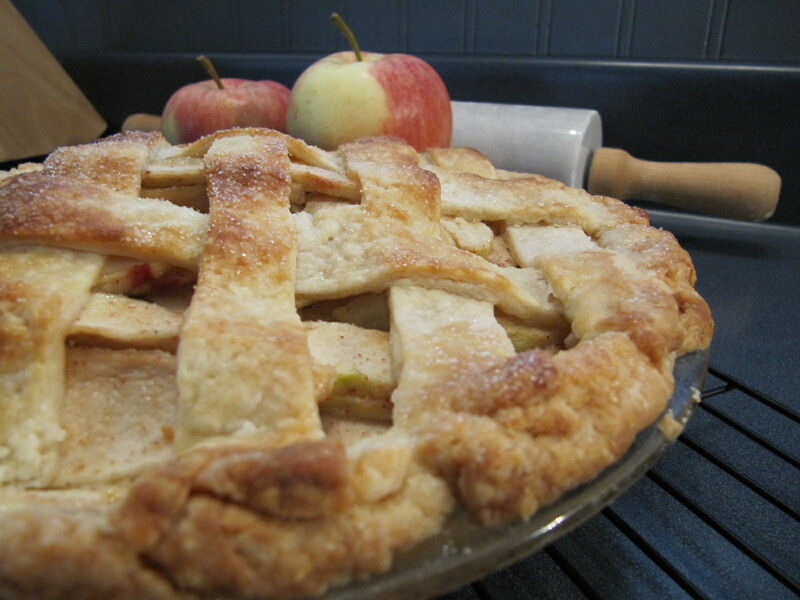 This month was apple pie. I am not a huge pie fan, in fact there are really only 2 pies that I like, pecan pie and my Gramma’s Raisin pie. These pies are 2 of the sweetest pies I have ever tasted, you can almost feel your teeth rotting as you chew, they are wonderful! 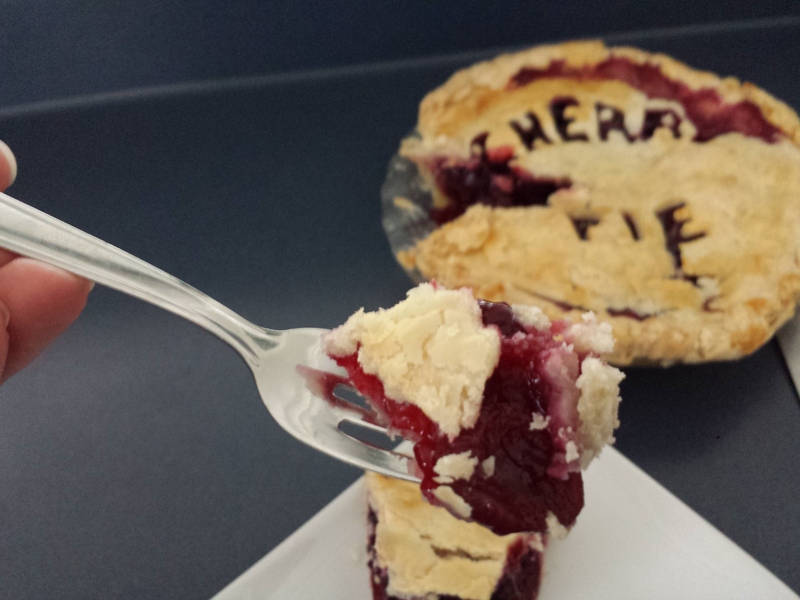 Normally I pass on pie because I don’t like ‘fruit’ for dessert, and most pies are fruit pies. Even though I don’t like pie I was excited to do this challenge because my family loves pie! 1. 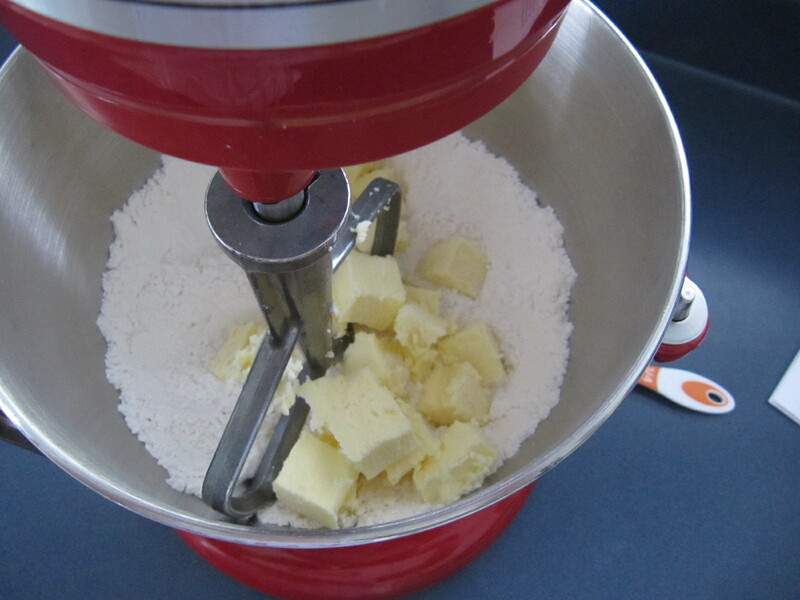 Stir the flour, sugar and salt to combine in a bowl or using a stand mixer fitted with the paddle attachment. 2. 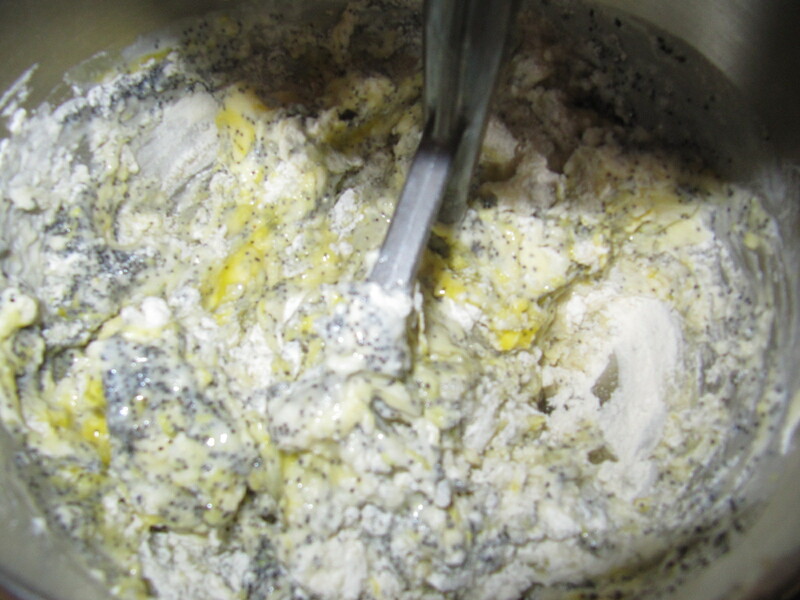 Cut in the butter by hand with a pastry cutter or on low speed until just small pieces of butter are visible and the mixture as a whole just begins to take on a pale yellow colour (indicating that the butter has been worked in sufficiently). 3. 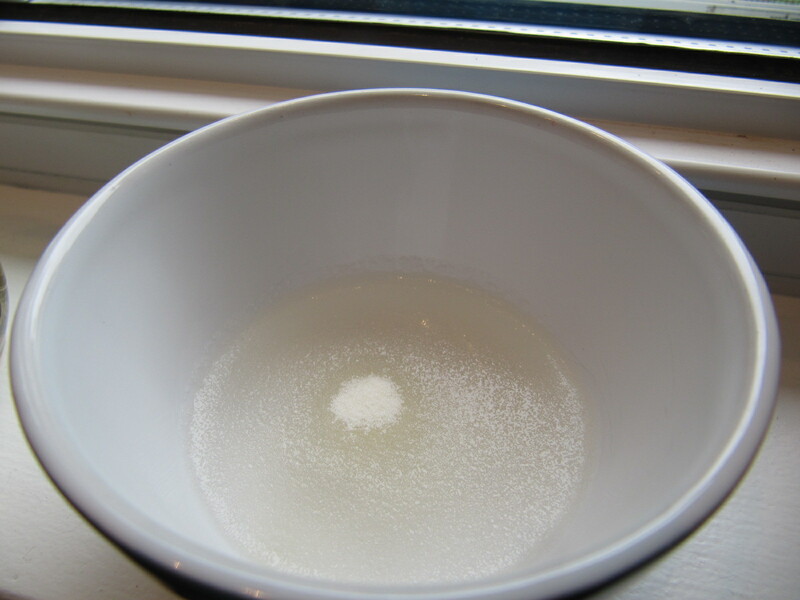 Stir the water and lemon juice together and add this to the dough all at once, mixing until the dough just comes together. 4. 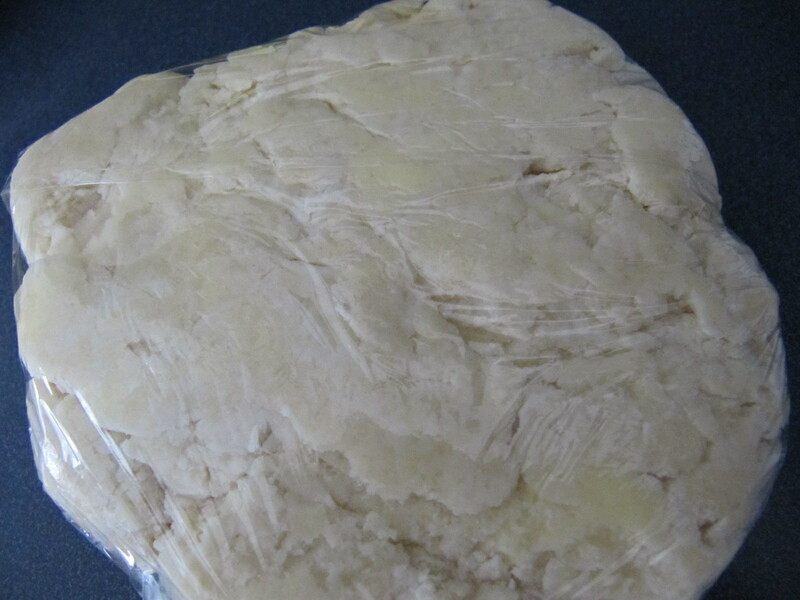 Shape the dough into 2 discs, wrap and chill for at least 2 hours before rolling. 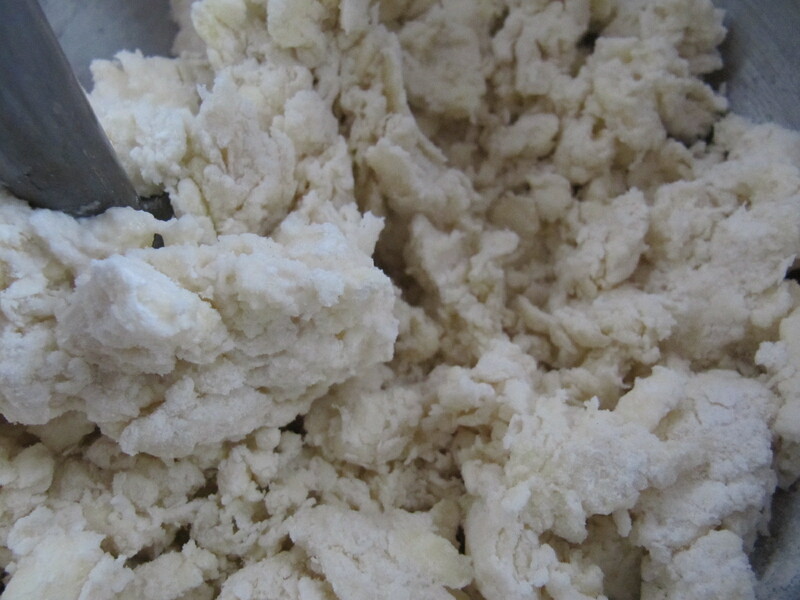 Alternatively, the dough can be frozen for up to 3 months and thawed in the fridge before rolling. 1. Position rack in lowest third of oven and preheat to 400°F. 2. Mix first 6 ingredients in large bowl. 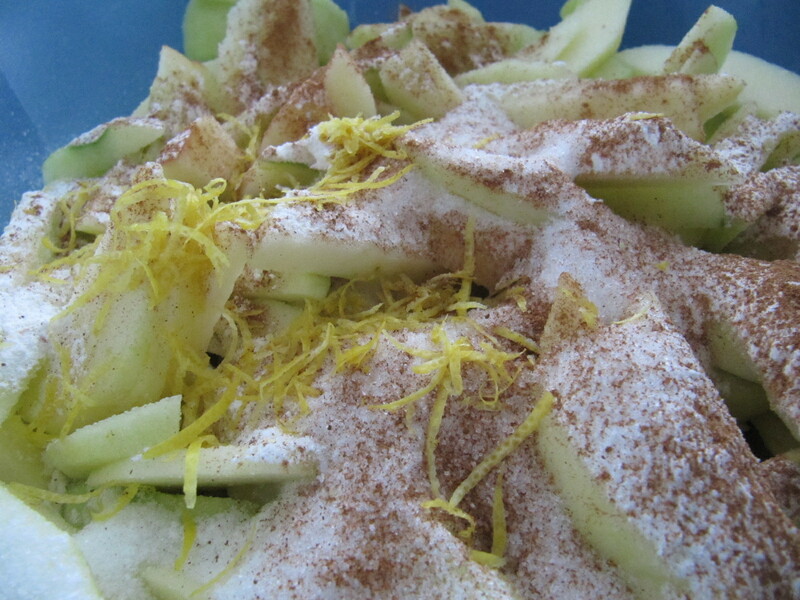 Add apples and toss to blend. 3. 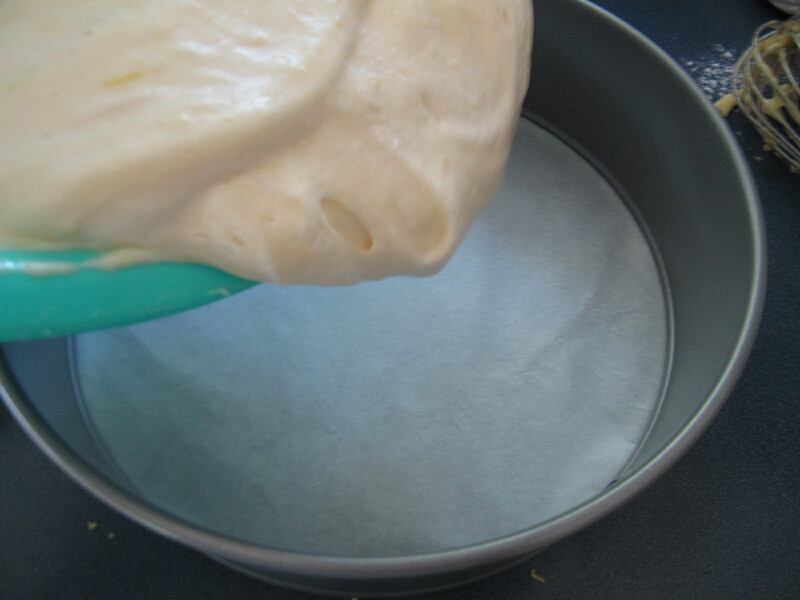 Roll out 1 dough disk on floured surface to 12-inch round. 7. Bake pie 10 minutes. 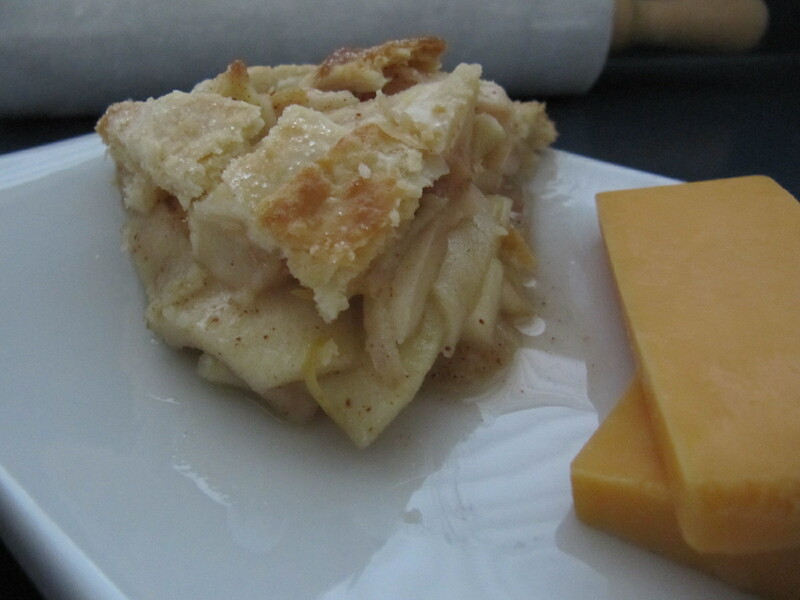 Apple Pie without Cheese is like a hug without a squeeze! It was just like eating apples, not pie. I was disappointed. Some people loved it, some said it was good. No one was ‘wowed’. Thought the crust got rave reviews. I really enjoyed this challenge! Thank you crazy cooks for returning, I look forward to next months Challenge! I stepped outside of my comfort zone today, well actually I did a triple back flip and an Irish Jig when I landed, and made Watermelon Salad!! There wasn’t any sugar, chocolate or flour, amazing that I even attempted it, really. Anyways…. 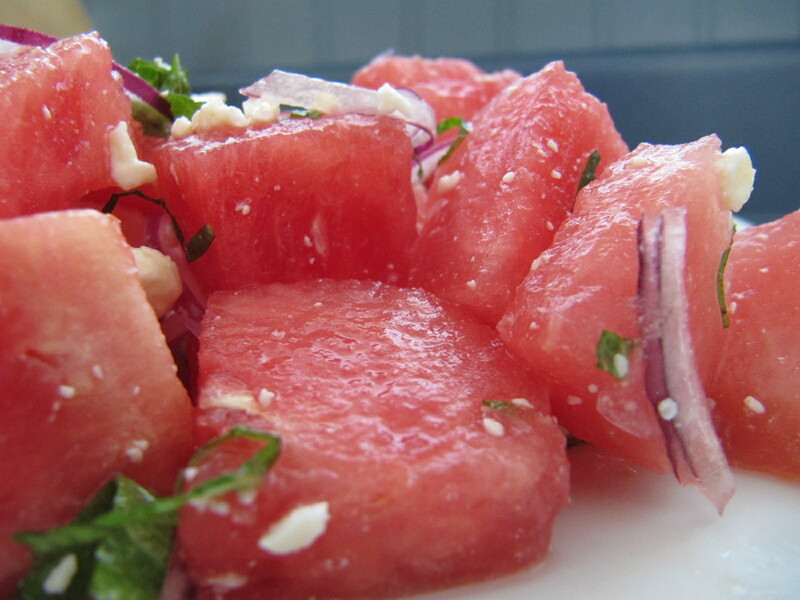 It was a year or so ago when I first saw a ‘Watermelon Salad’, it really peaked my interest. More and more they were popping up, and I kept saying ‘I’d like to try that’. I have been asking around and no one that I knew had tried it. I was hoping for someone to tell me either way to see if it was worth a try. I looked up a lot of different recipes and they were all basically the same, watermelon, feta, onions, mint and a dressing. The one thing that really got me was feta? really? 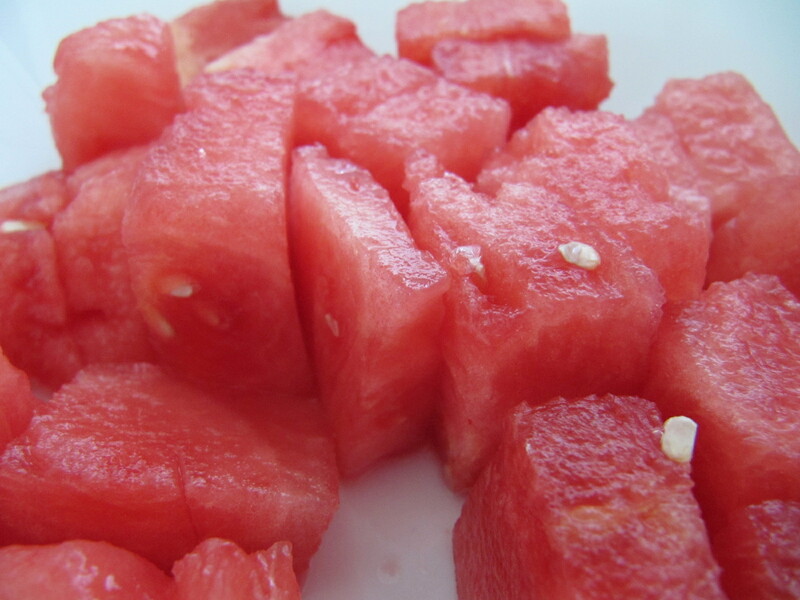 Feta and Watermelon? how could this be good? Well, today was the day, I was going to try it! Being that I wasn’t sure, I scaled down the recipe only using 1 cup of melon and a 1/6 of everything else. 1. 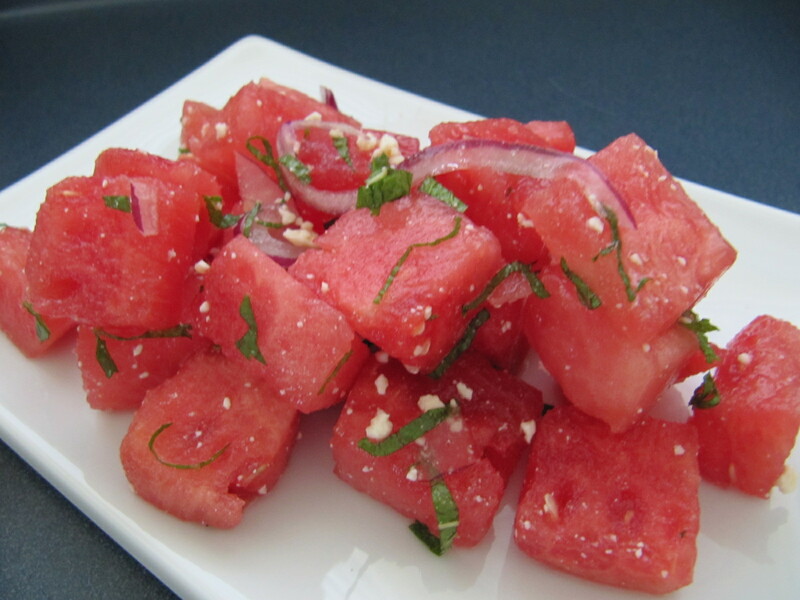 Combine watermelon, feta cheese, red onion, and mint in a large bowl. 2. 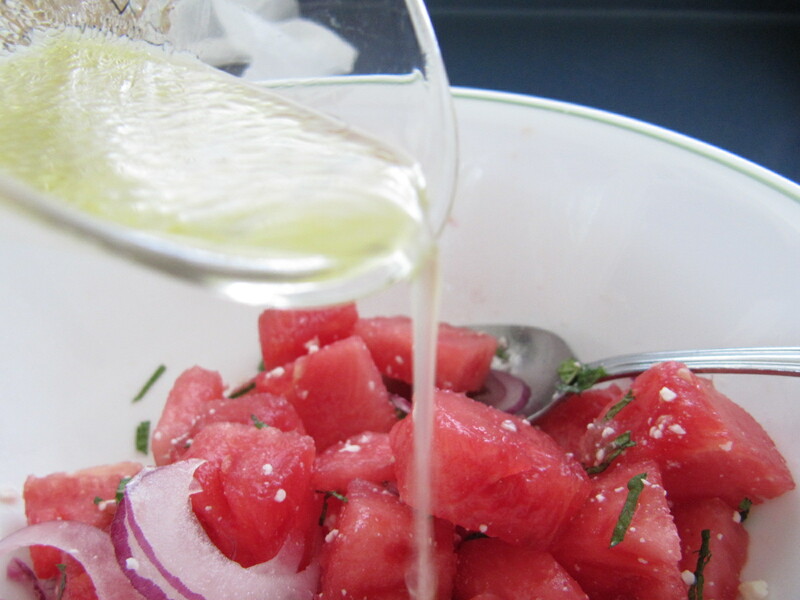 Pour the lime juice and olive oil over the watermelon mixture and toss gently to coat. I was pleasantly surprised, it was pretty good! 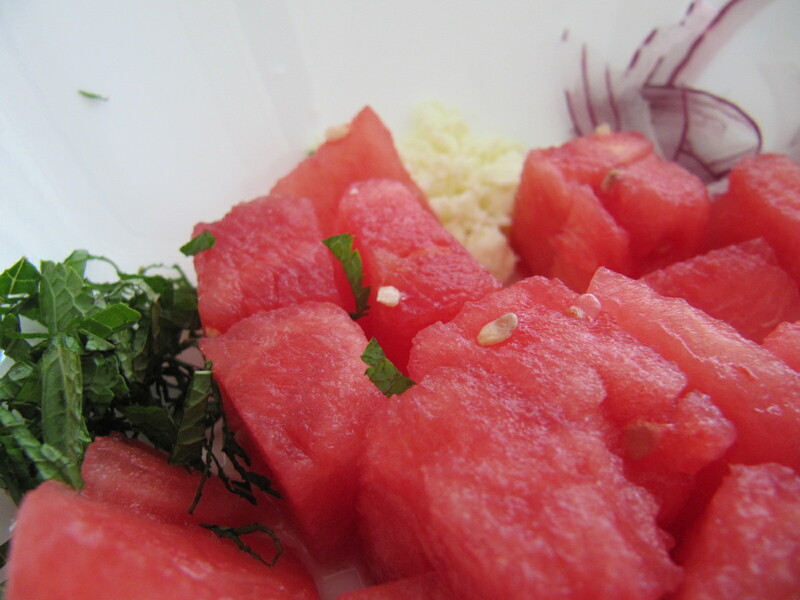 The feta and watermelon went together better than I expected, they seem to complement each other. 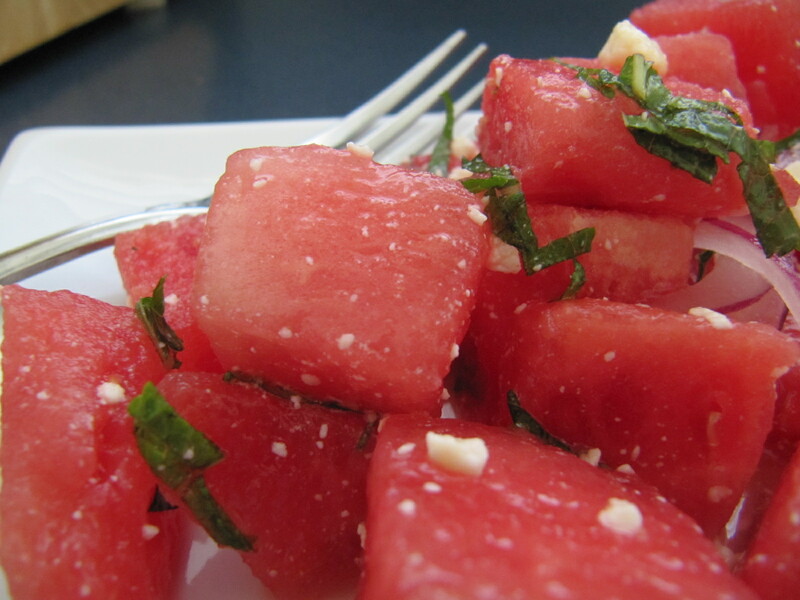 The watermelon seems to cut the salt and tang of the feta. The onions gave it a bit of a bite and a nice citrus zing with the lime dressing. Next time, I think I will omit the mint. 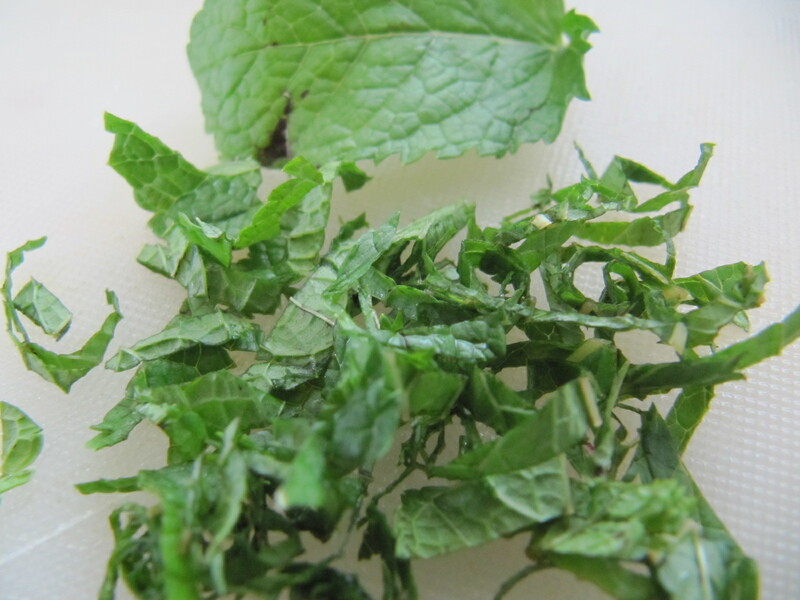 Maybe I just added too much but it did give me a very overpowering mint flavour. Reminded me too much of Gum. A lovely fresh and refreshing salad I will be making again! 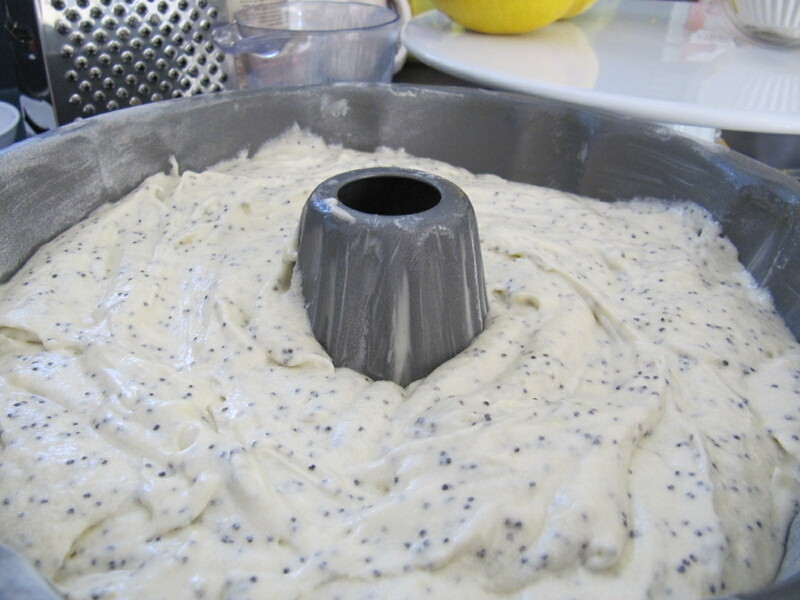 Earlier this week my Aunt asked if I would make her a Lemon Poppy Seed Cake, of course I answered YES! Me turn down a chance to bake? are you kidding? I was kind of excited because I have been wanted to make something for a while, but didn’t want to have it around for me to eat. 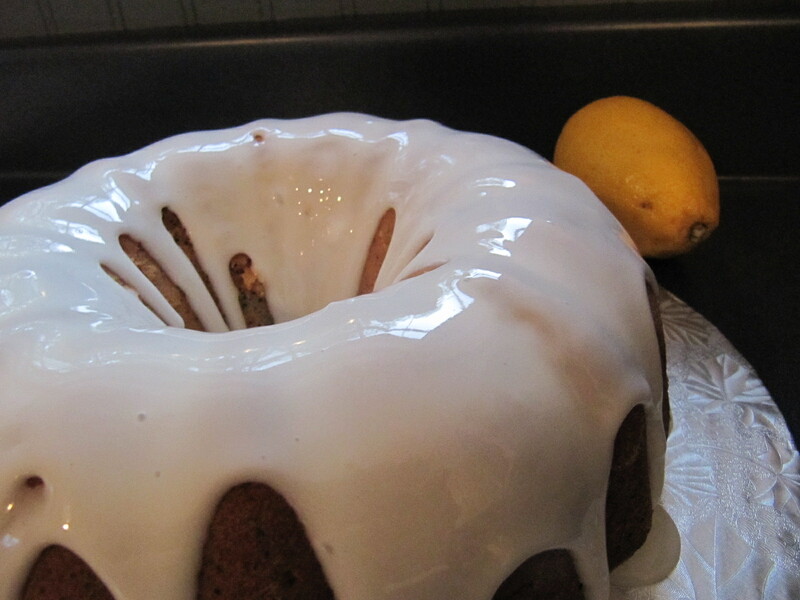 It was also a challenge because I had never made a lemon poppy-seed cake before. I immediately start searching for recipes as soon as I came home. There were so many different recipes, I was quite surprised that a lot of them started with a box mix! Well, that wasn’t going to happen!! I decided to use one from sprinklesofparsley.com (by the way, the Lemon Poppy Seed Cake wasn’t the only good things there. Some very nice recipes I will be trying in the future). This recipe intrigued me because of the directions. 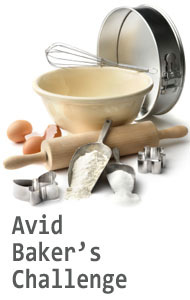 Most cakes there is a specific order on how to do things, when to add, how long to mix, etc etc. Not this one, Check it out. 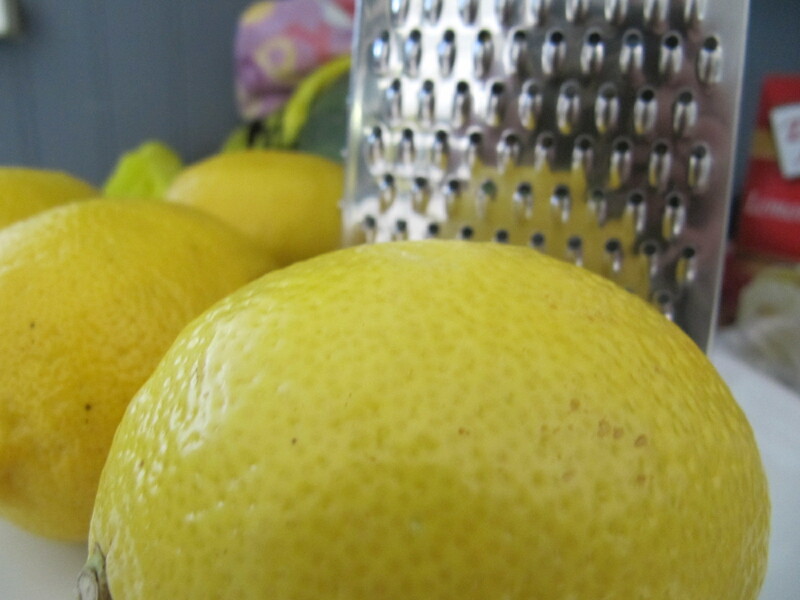 I just love lemons, I can eat them just as is, I love the sour pucker they give you. 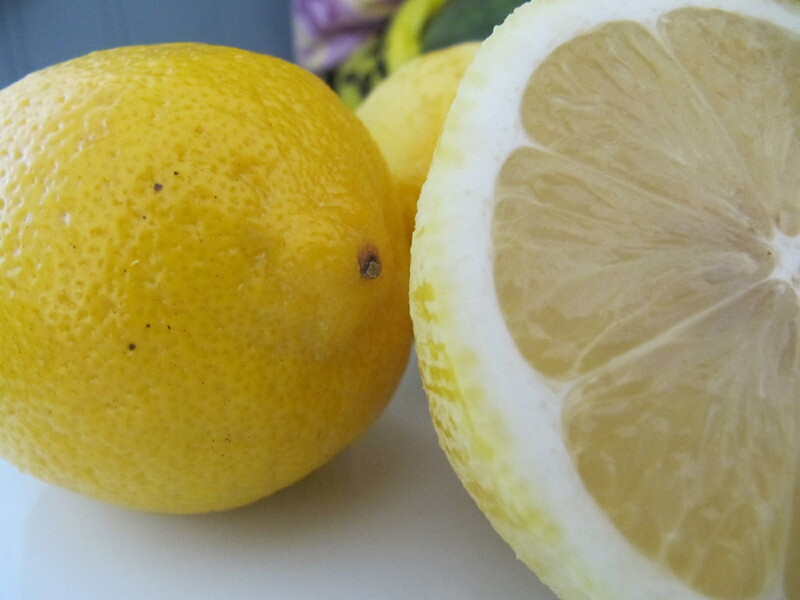 It doesn’t matter if its dessert, a meal or a beverage, haven’t found a lemon dish I didn’t like. 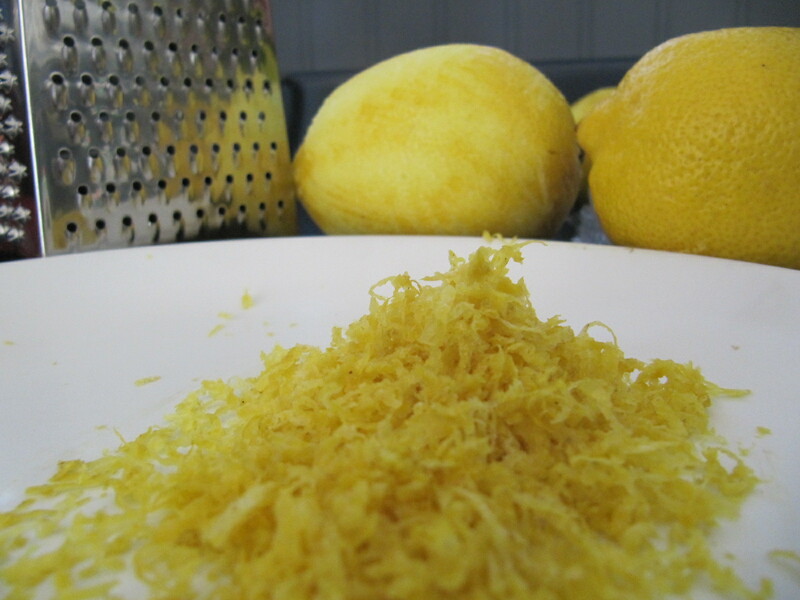 Bare with me, I went a little crazy on the lemon photos. 2. Mix on low, scraping the sides occasionally. 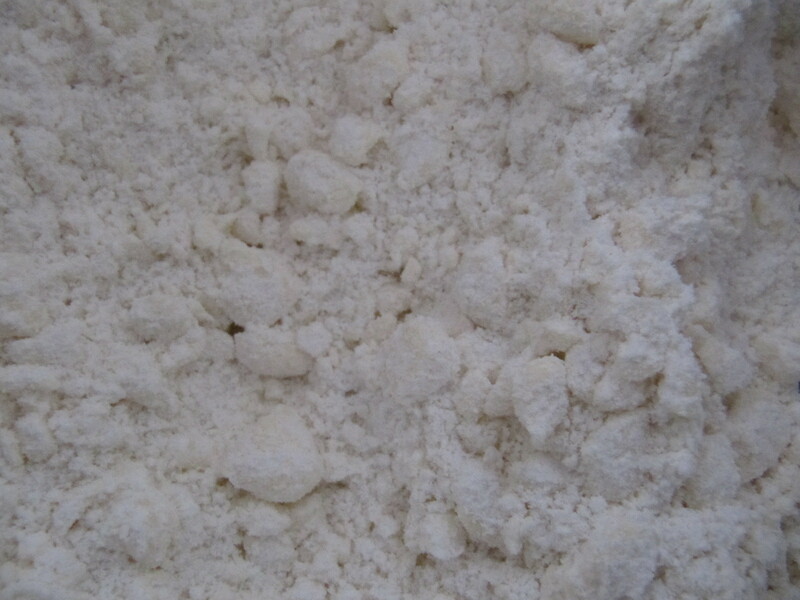 Until your wet and dry ingredients are just combined, about 30 seconds. 3. 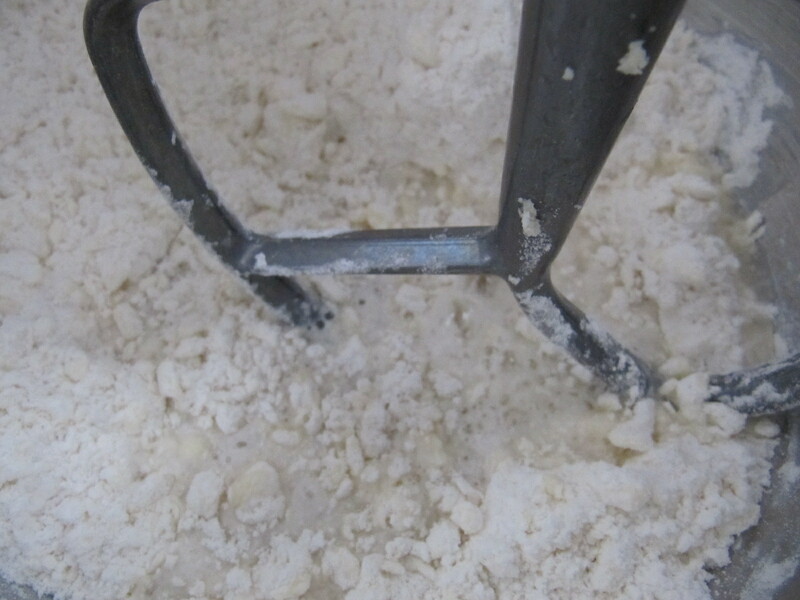 Then increase your speed to high and mix for 2 minutes until your batter is thick and smooth. 5. Bake at 325 degrees for 60-65 minutes or until a toothpick inserted comes out clean. 6. 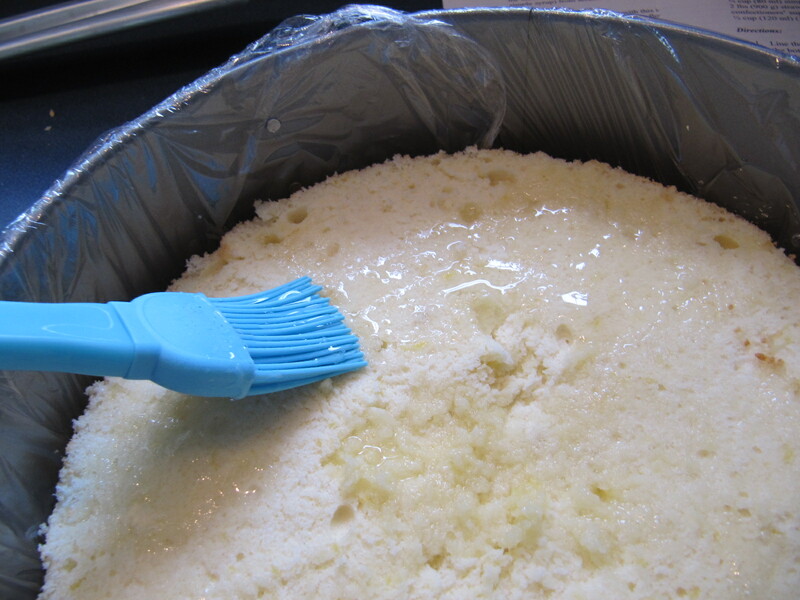 Once baked, let your cake cool for 10 minutes. Flip it over onto a cake stand and allow it to cool completely. 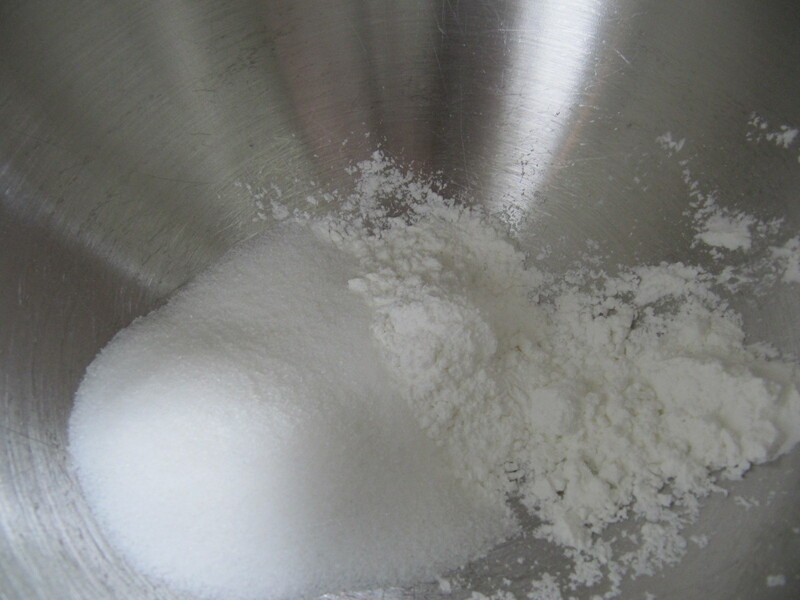 Meanwhile, to prepare your icing combine 1 cup of powdered sugar and 1 1/2 tablespoons lemon juice. Stir until smooth. 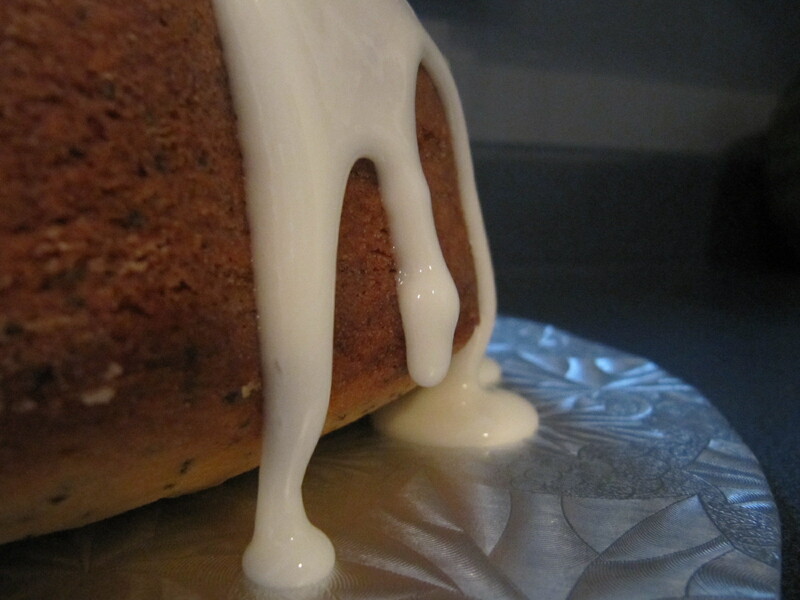 Once your cake is cooled, drizzle with your icing. Serve and enjoy! First off I want to thank everyone for the wonderful feedback on last months challenge, I had an amazing time hosting. It took me over a week but I think I visited everyone’s blog who posted on the “Completed Forum”. WOW, there were some beautiful baklava’s and such creative fillings. I am such a “by the recipe” baker, I wish I had the creativity and knowledge of flavour combinations that a lot of people have. When I made baklava again I will definitely be using some of your ideas. 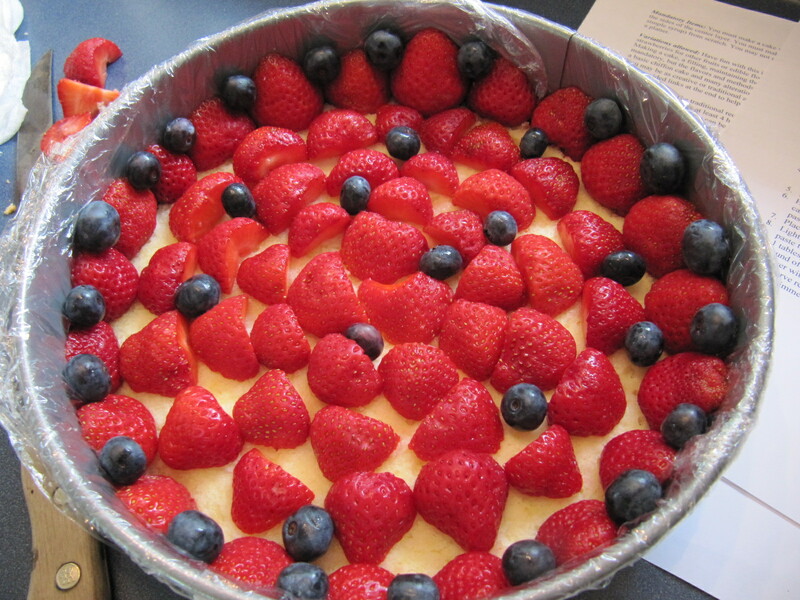 I have to admit when I first saw what we were making I though, blah…I am not a huge fan of desserts with fruit. I am of the thinking if you’re having dessert it has to be chocolatey, gooey, and super sweet, and that fruit is a refreshing snack, not something I consider a dessert. 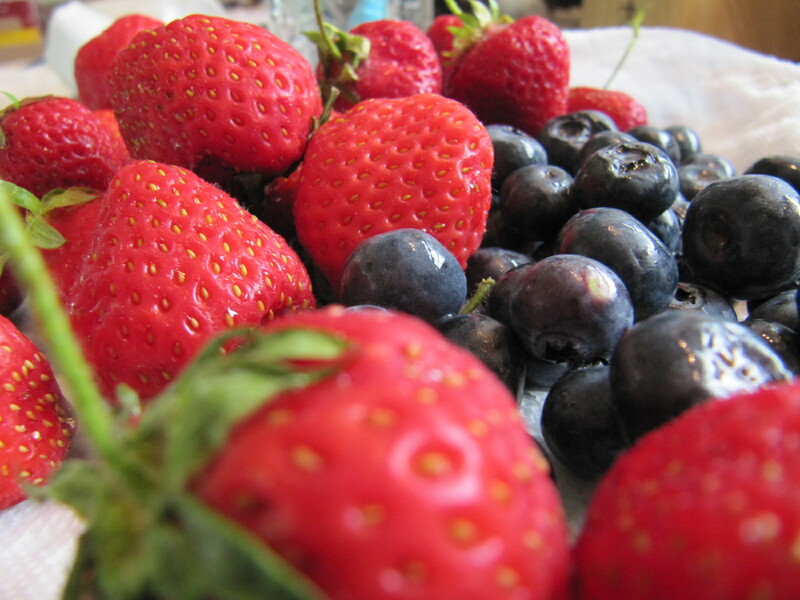 Don’t get me wrong, I LOVE fruit especially this time of year with all the fresh berries, just not for dessert. Fresh Frasiers, with my limited ability to understand french I was able to get that it has something to do with strawberries, but I had never heard of it before. 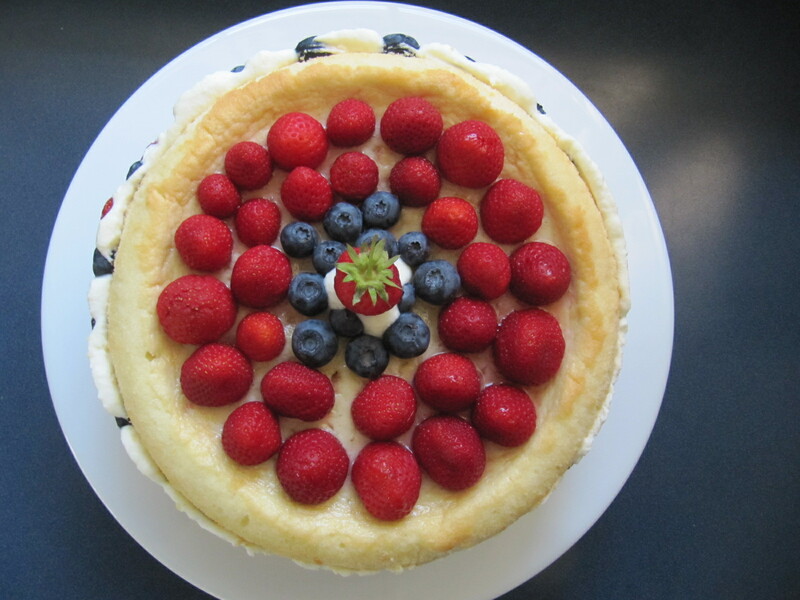 Mandatory Items: You must make a cake with exposed fruits, edible flowers, etc. around the sides of the center layer. 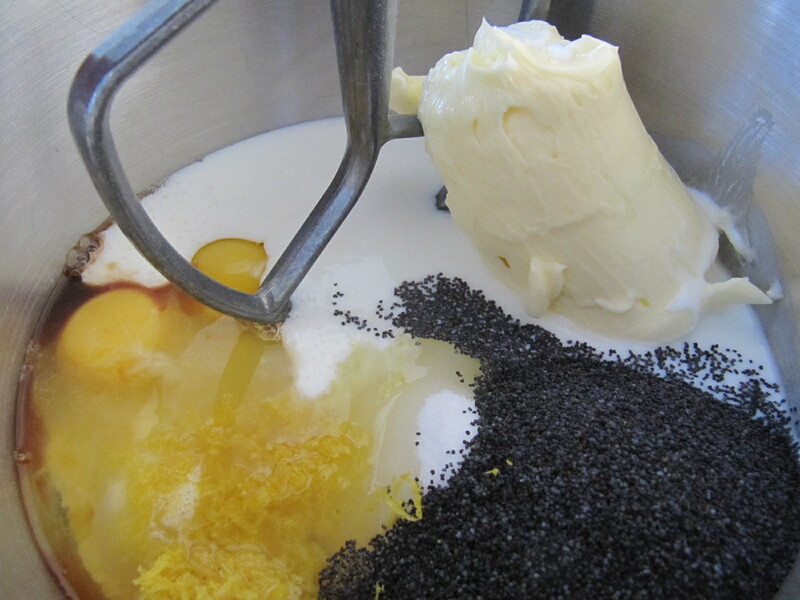 You must make all components (cake, pastry cream mousse, simple syrup) from scratch. 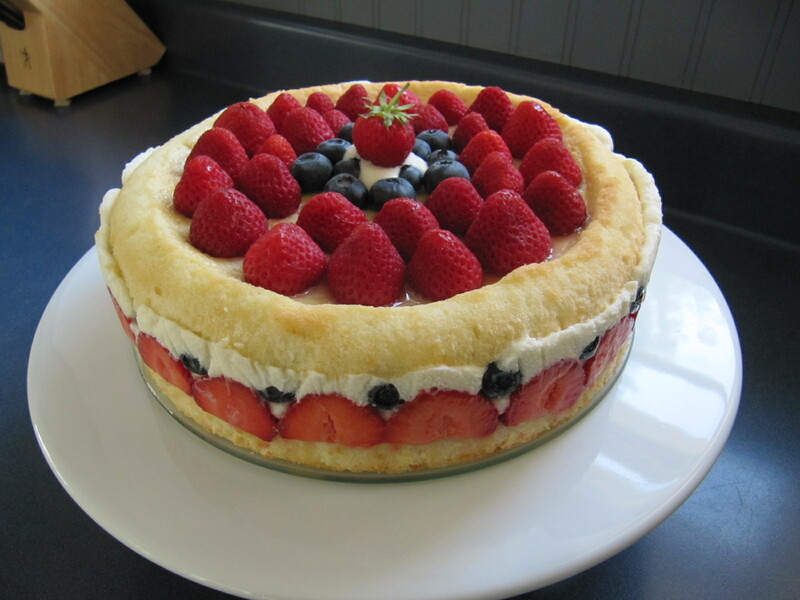 You may not make a trifle. It must be a free-standing cake on a platter. Variations allowed: Have fun with this idea! I love creativity so feel free to mix up the strawberries for other fruits or edible flowers, freeze the mousse as an ice cream etc. 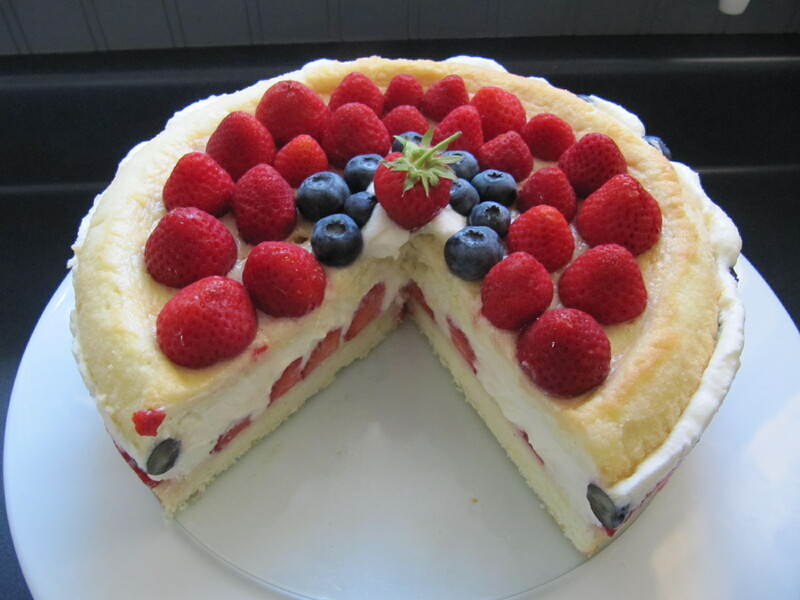 Making a cake, a filling, maintaining the structure of the cake with the exposed fruits is mandatory, but the flavors and methods should be just plain fun! 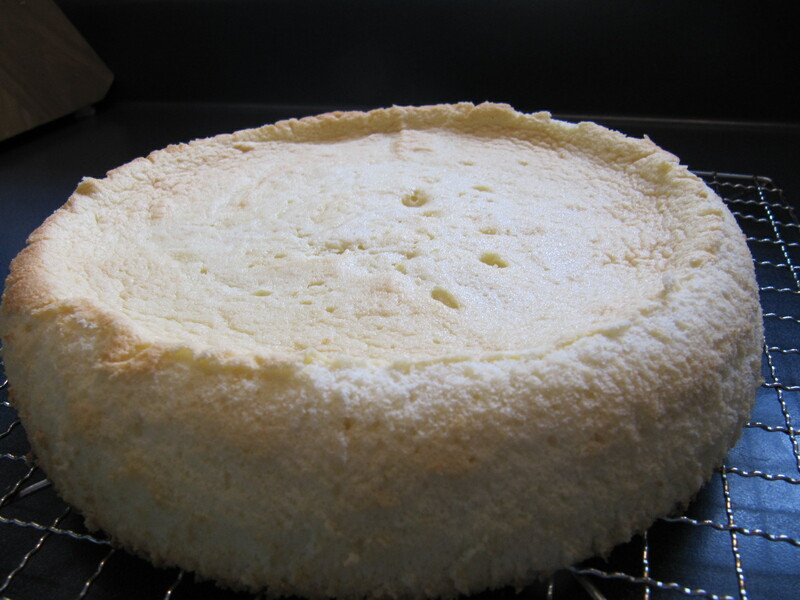 I am providing you with a basic chiffon cake and many alterations (lemon, orange, coconut, and chocolate) to it! You may be as creative or traditional as you like! For the Vegan and Gluten-Free crowd I have provided links at the end to help with the portions of the recipe that will not suffice. 2. 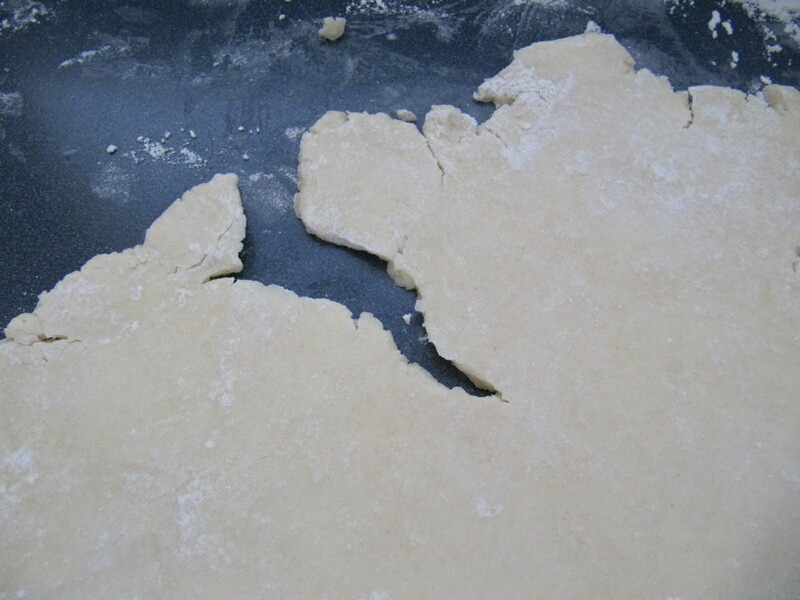 Line the bottom of an 8-inch (20 cm) spring form pan with parchment paper. Do not grease the sides of the pan. 3. 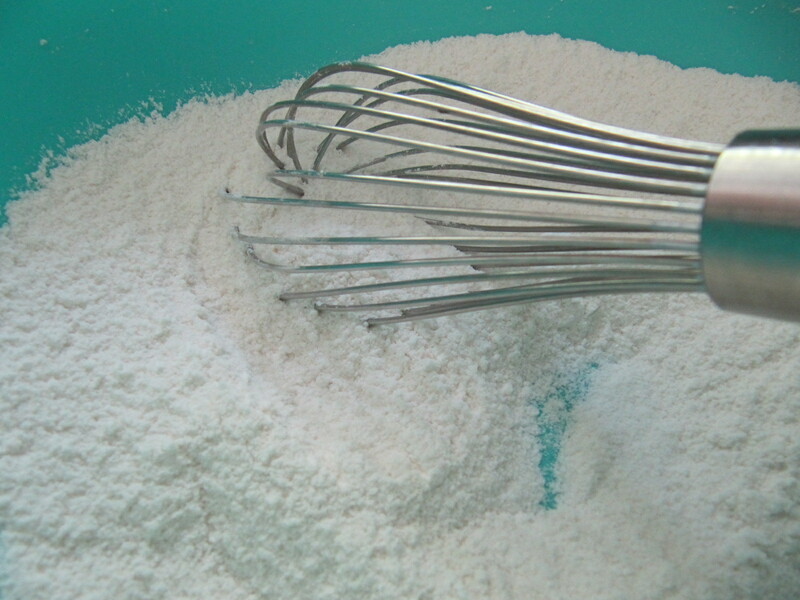 In a large mixing bowl, stir together the flour and baking powder. 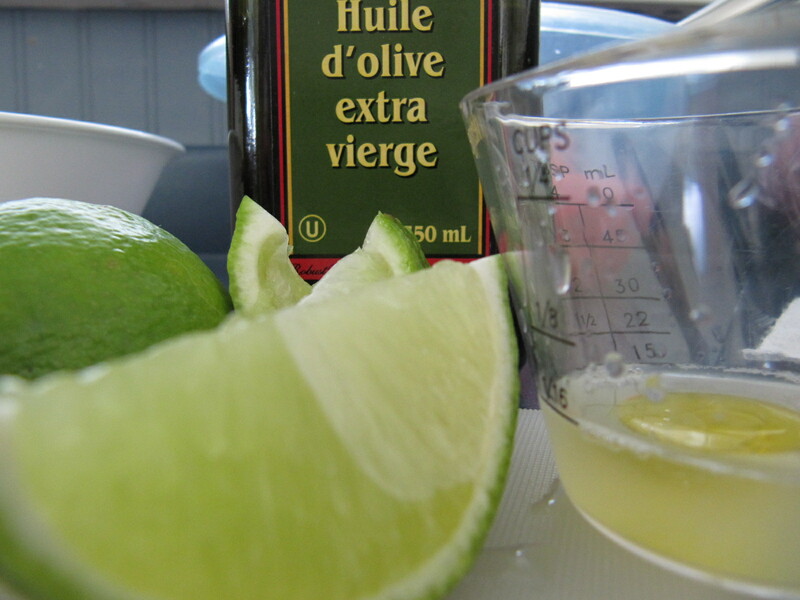 Add in all but 3 tablespoons (45 ml.) of sugar, and all of the salt. Stir to combine. 4. 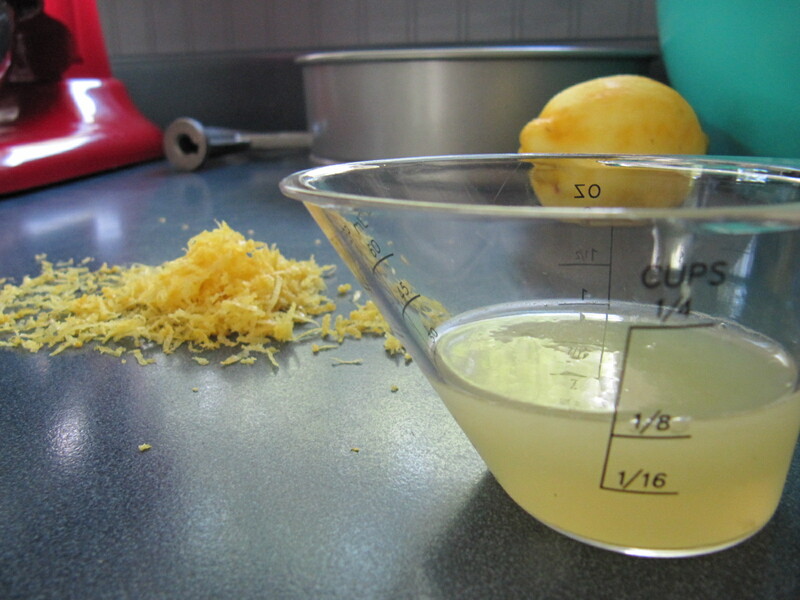 In a small bowl combine the oil, egg yolks, water, lemon juice and lemon zest. Whisk thoroughly. 6. 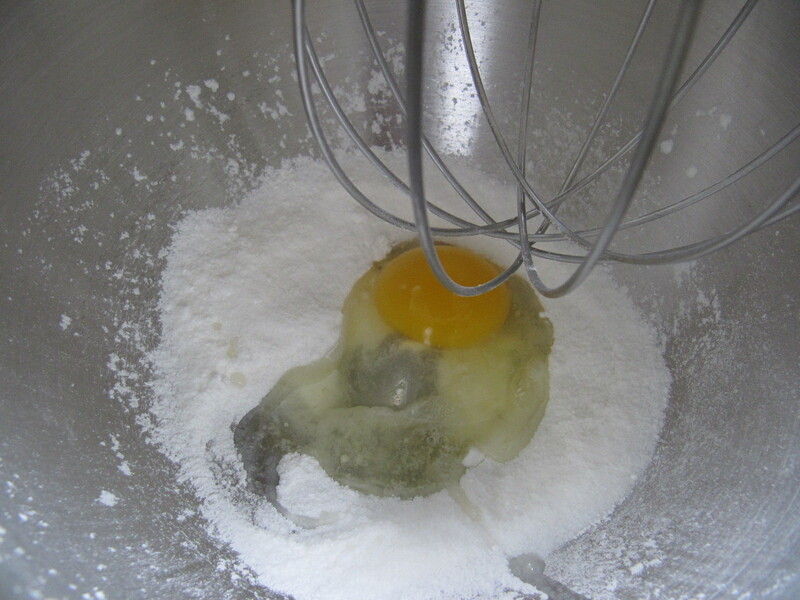 Put the egg whites into a stand mixer, and beat on medium speed using a whisk attachment on a medium speed, until frothy. 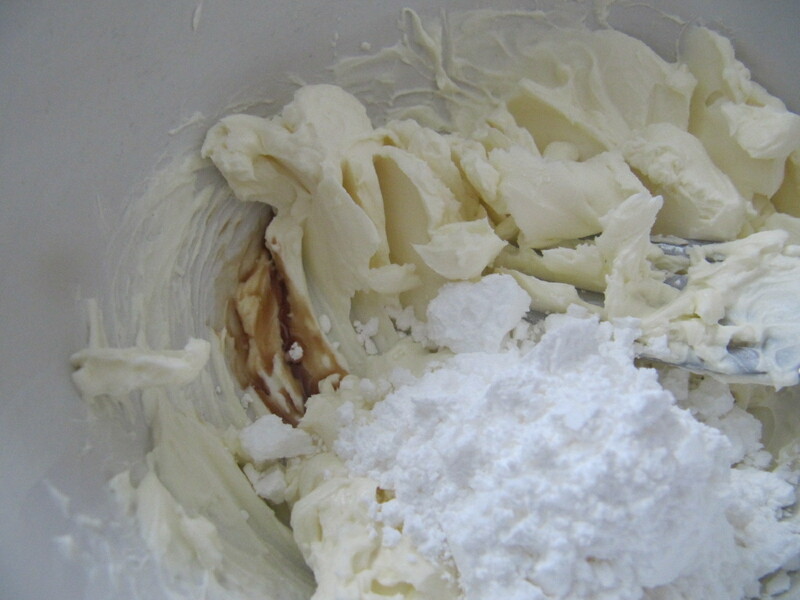 Add cream of tartar and beat on a medium speed until the whites hold soft peaks. 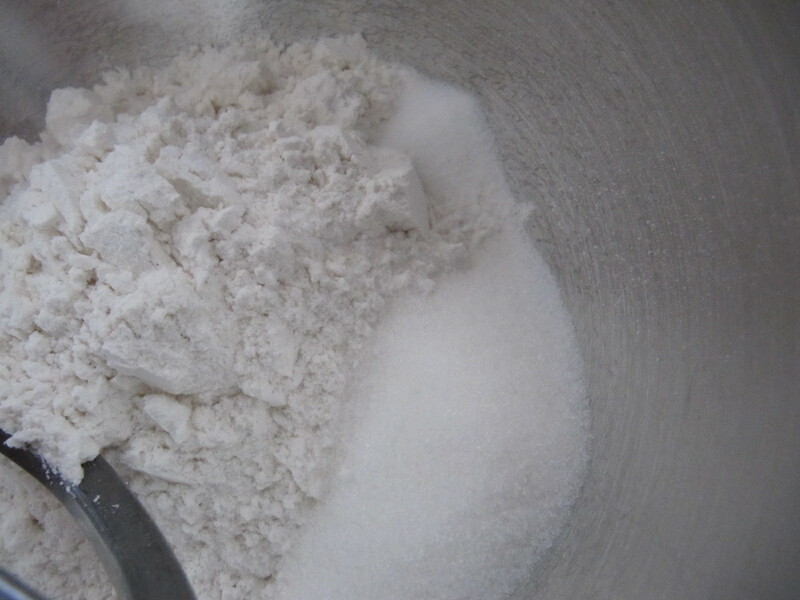 Slowly add the remaining sugar and beat on a medium-high speed until the whites hold firm and form shiny peaks. 7. 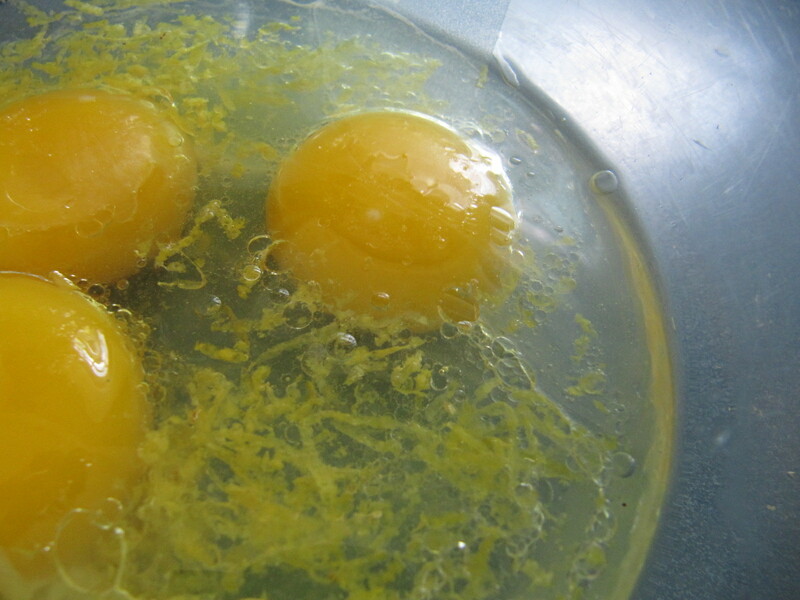 Using a grease free rubber spatula, scoop about ⅓ of the whites into the yolk mixture and fold in gently. Gently fold in the remaining whites just until combined. 8. Pour the batter into the prepared pan. 9. 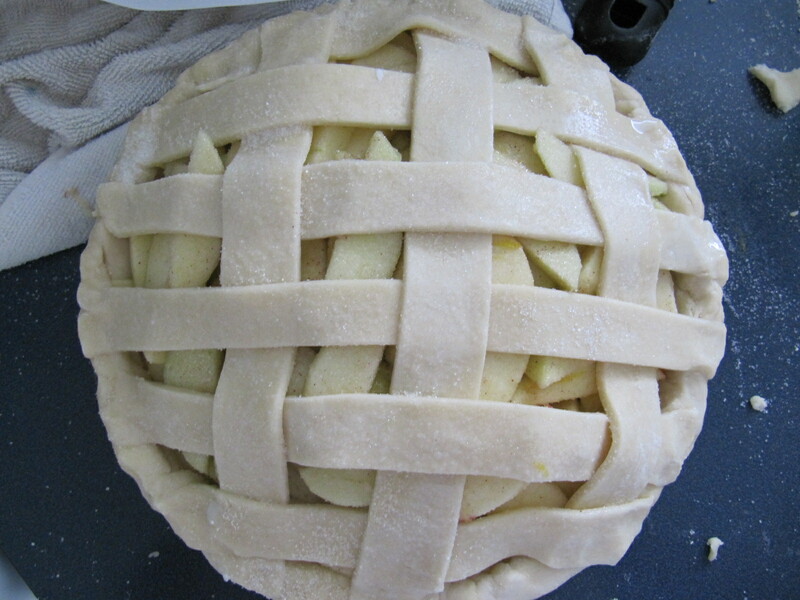 Bake for 45 to 55 minutes or until toothpick inserted into the center comes out clean. 10. Removed the cake from the oven and allow to cool in the pan on a wire rack. 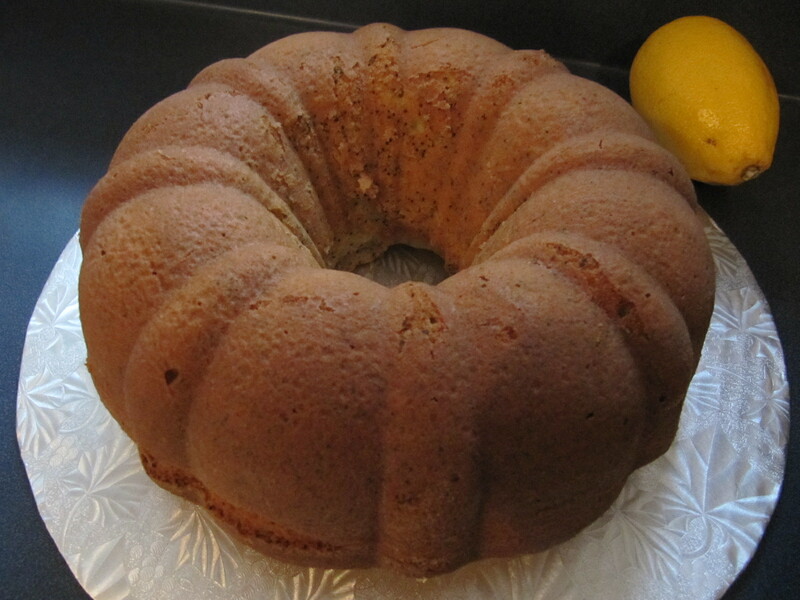 To unmold, run a knife around the sides to loosen the cake from the pan and remove the spring form sides. Invert the cake and peel off the parchment paper. 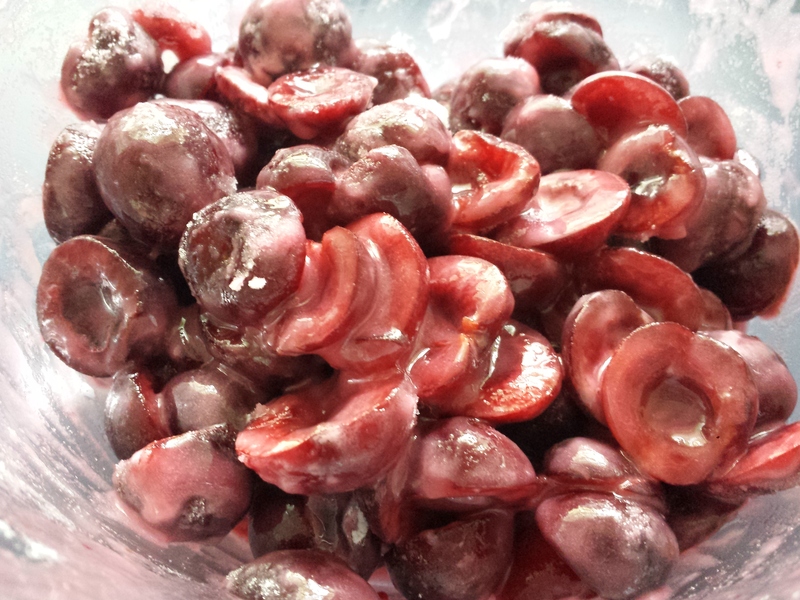 Refrigerate for up to four days. 1. 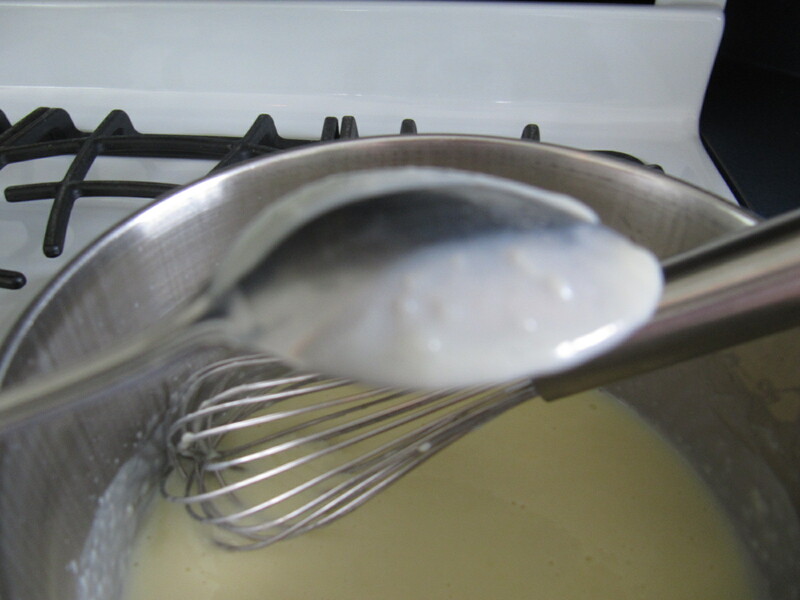 Pour the milk, vanilla, and salt into a heavy sauce pan. Place over medium-high heat and scald, bringing it to a near boiling point. Stir occasionally. 4. 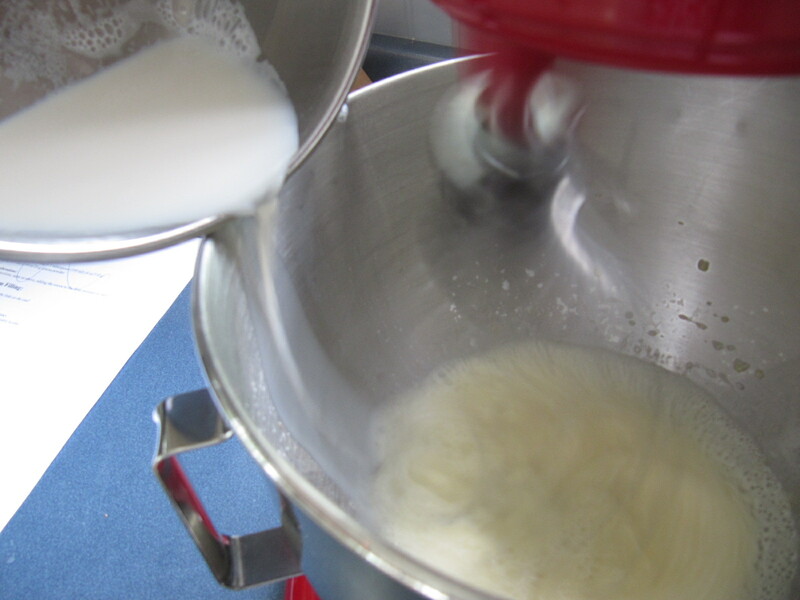 When the milk is ready, gently and slowly while the stand mixer is whisking, pour the heated milk down the side of the bowl into the egg mixture. 5. Pour the mixture back into the warm pot and continue to cook over a medium heat until the custard is thick, just about to boil and coats the back of a spoon. 6. 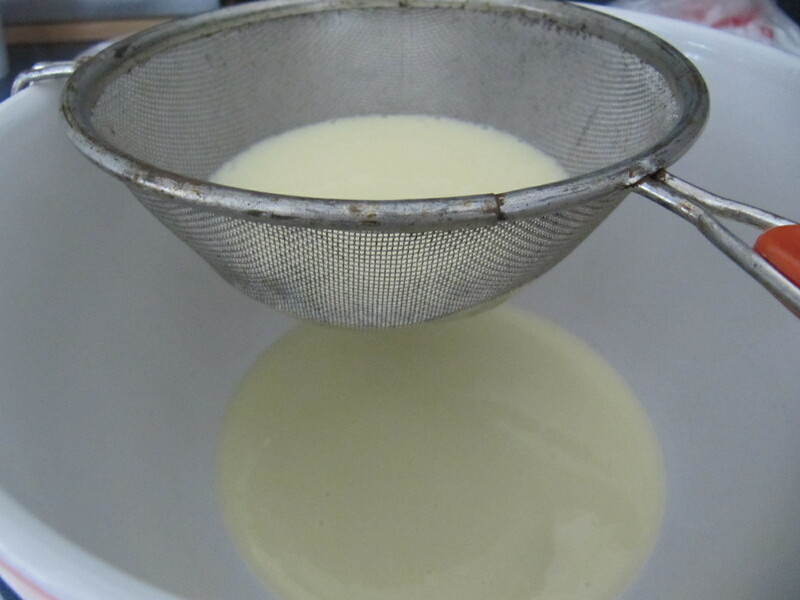 Remove from heat and pass through a fine mesh sieve into a large mixing bowl. Allow to cool for ten minutes stirring occasionally. 8. 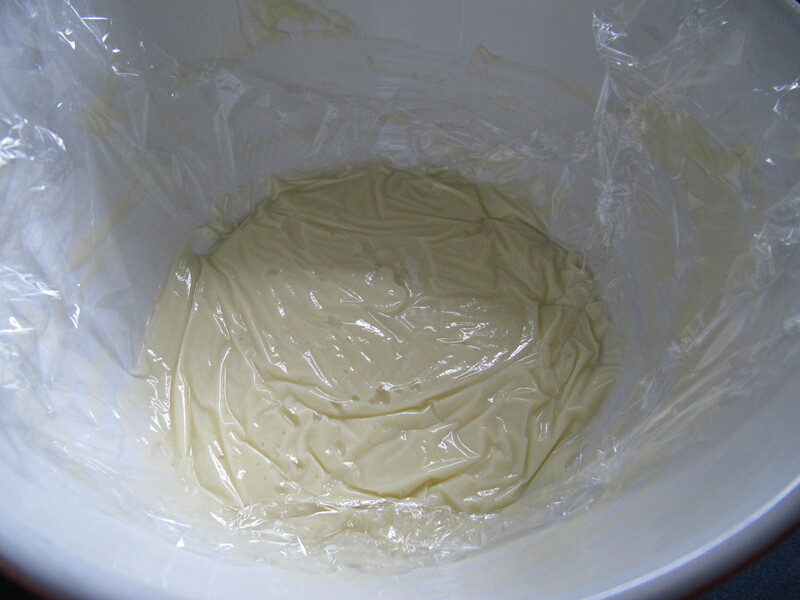 Cover the cream with plastic wrap, pressing the plastic wrap onto the top of the cream to prevent a skin from forming. Chill in the refrigerator for up to five days. 11. 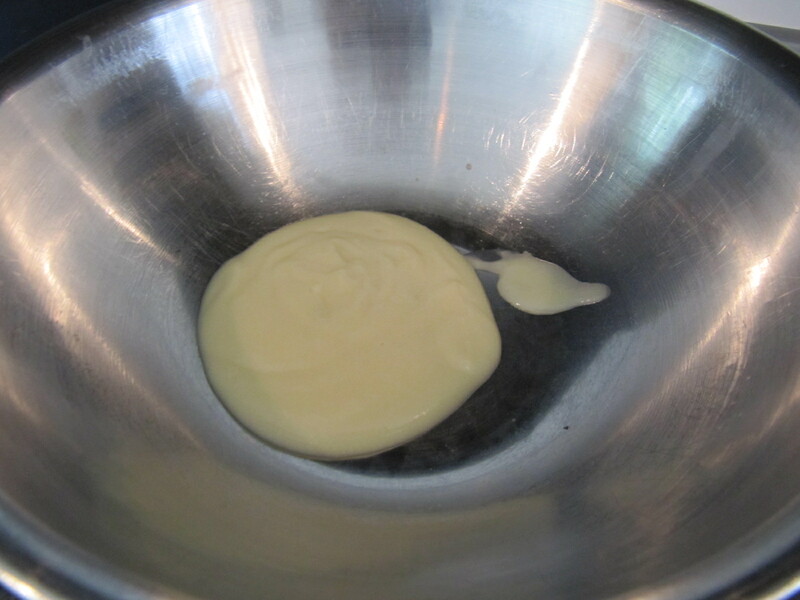 Measure 1/4 cup (2 oz/60 ml) of the chilled pastry cream into a small stainless steel bowl that will sit across the sauce pan with the simmering water, without touching the water. 12. Heat the cream until it is 120 F (48.8 C). Add the gelatin and whisk until smooth. 13. 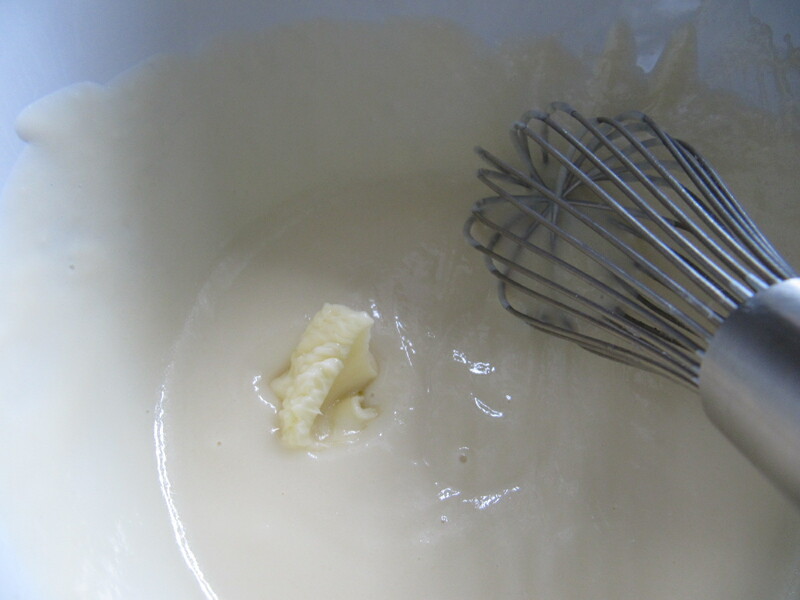 Remove from the water bath, and whisk the remaining cold pastry cream in to incorporate in two batches. 14. 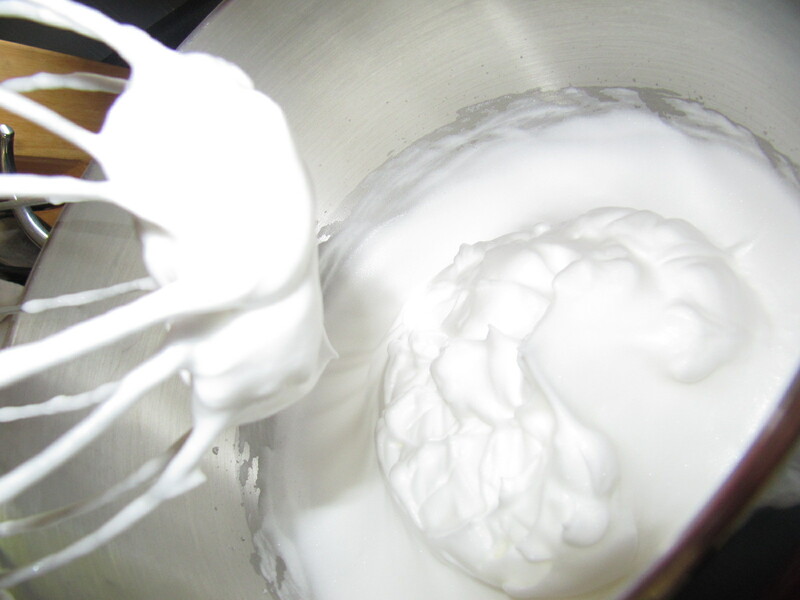 In a stand mixer, fitted with the whisk attachment, whip the cream until it holds medium-stiff peaks. 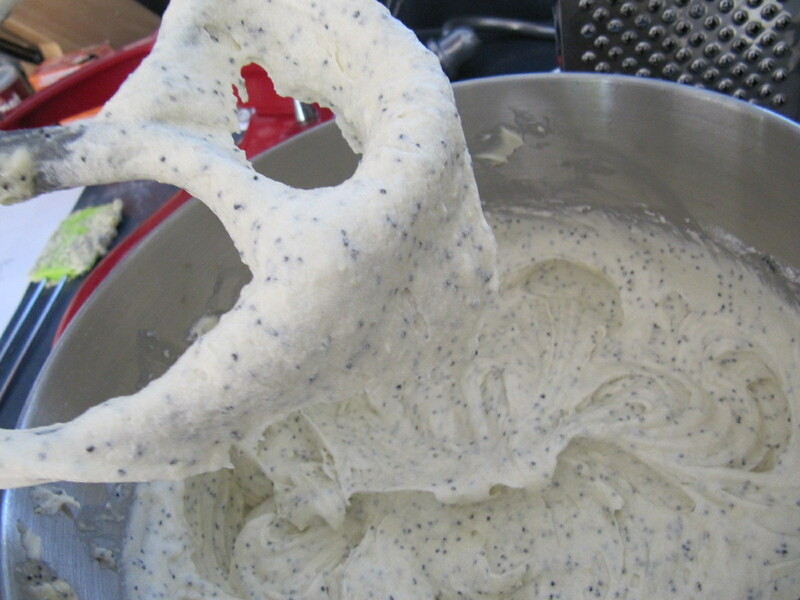 Immediately fold the whipped cream into the pastry cream with a rubber spatula. Bring the mixture to a boil and let the sugar dissolve. Stirring is not necessary, but will not harm the syrup. 2. Remove the syrup from the heat and cool slightly. 3. 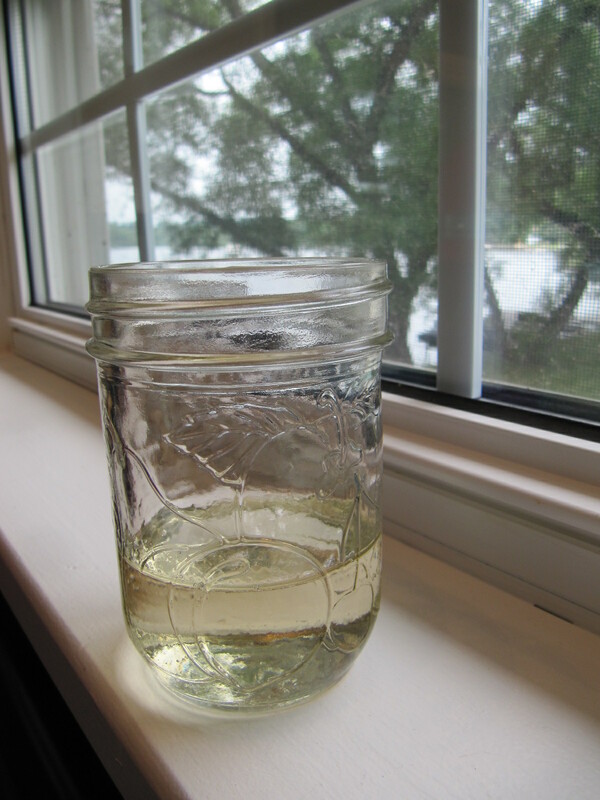 Transfer syrup to a lidded container or jar that can be stored in the refrigerator. Simple syrup can be stored for up to one month. 1. 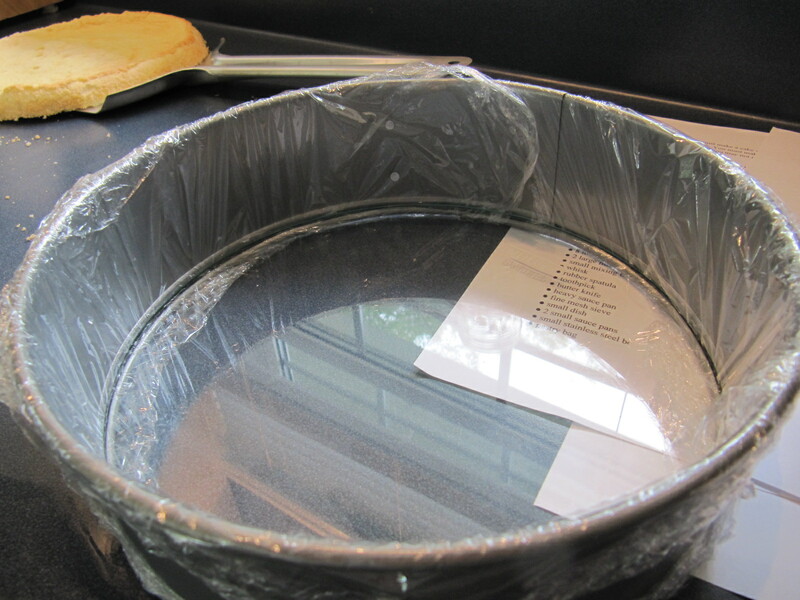 Line the sides of a 8-inch (20 cm) spring form pan with plastic wrap. Do not line the bottom of the pan. For some reason this was the most difficult part of the challenge, had a huge fight with the plastic wrap!! I actually had to walk away for a few minutes. 3. Fit the bottom layer into the prepared spring form pan. 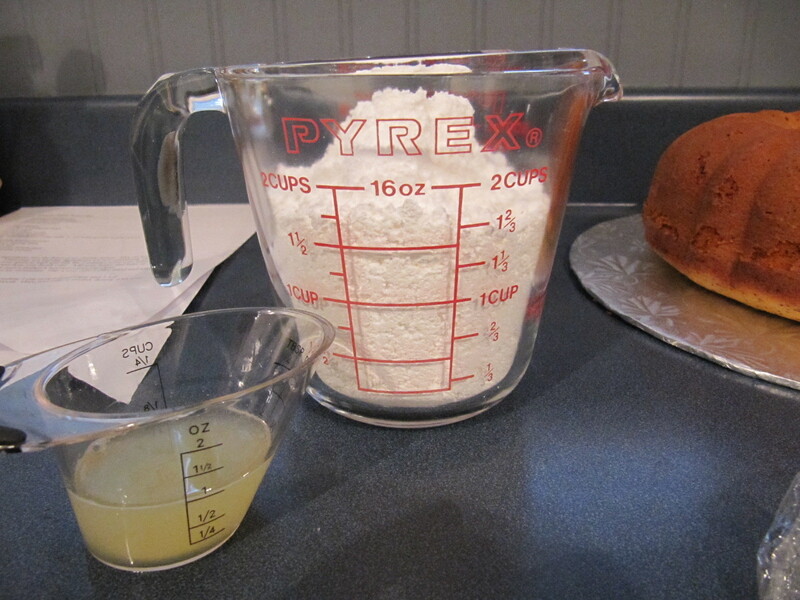 Moisten the layer evenly with the simple syrup. 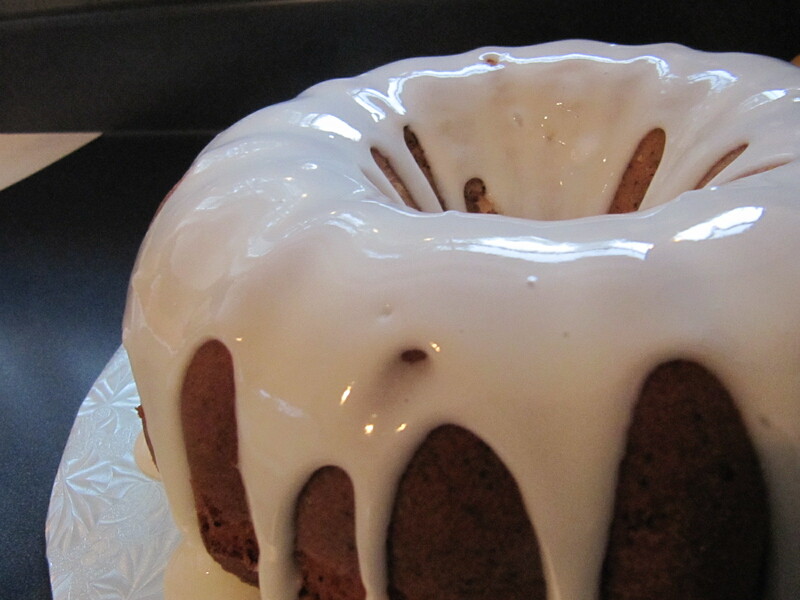 When the cake has absorbed enough syrup to resemble a squishy sponge, you have enough. 4. 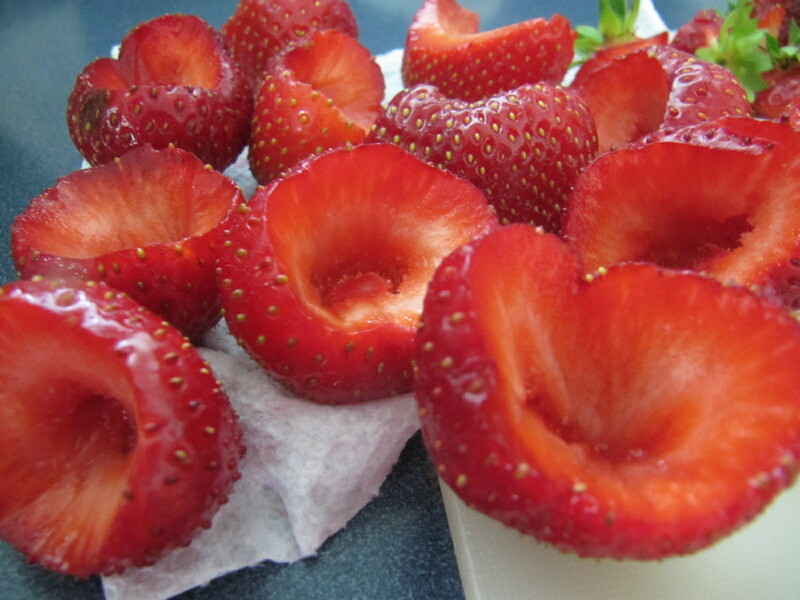 Hull and slice in half enough strawberries to arrange around the sides of the cake pan. 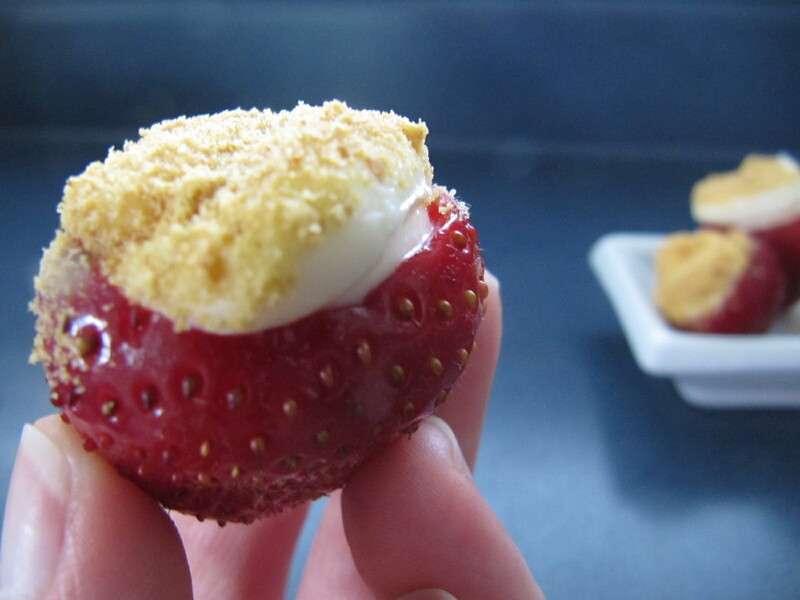 Place the cut side of the strawberry against the sides of the pan, point side up forming a ring. **I must take a moment to thank my Poppa for the beautiful strawberries he picked for me. He tends to spoil me a bit. 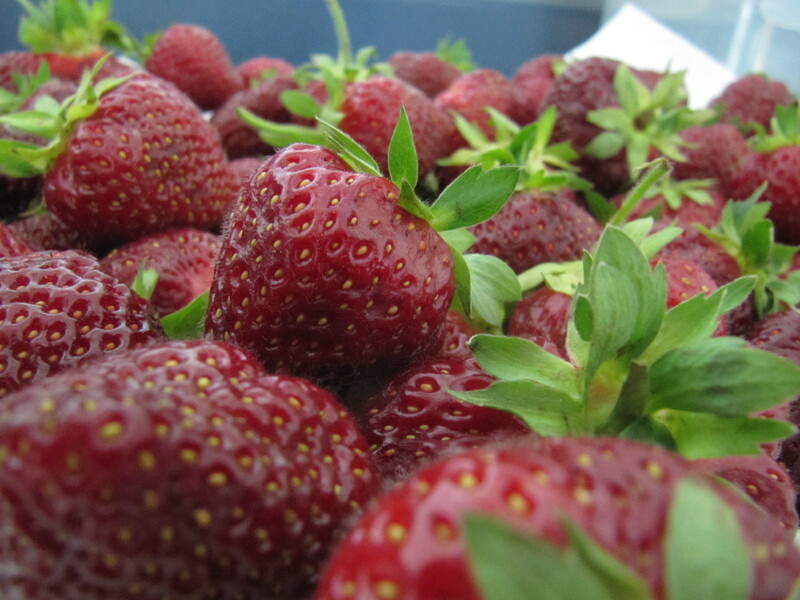 At 81 he was in the berry field on hands and knees picking baskets and baskets of strawberries. I was lucky enough to be the recipient of some of those. Thanks Poppa!!! 5. 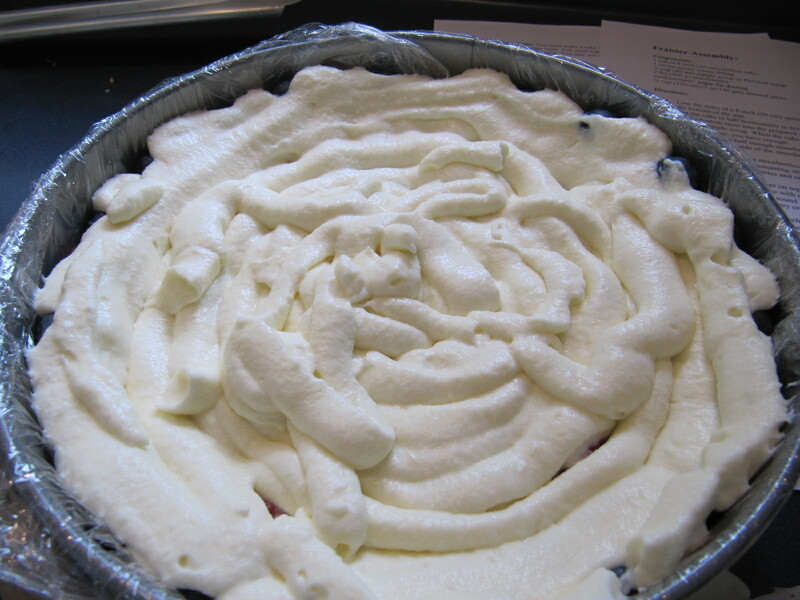 Pipe cream in-between strawberries and a thin layer across the top of the cake. 6. 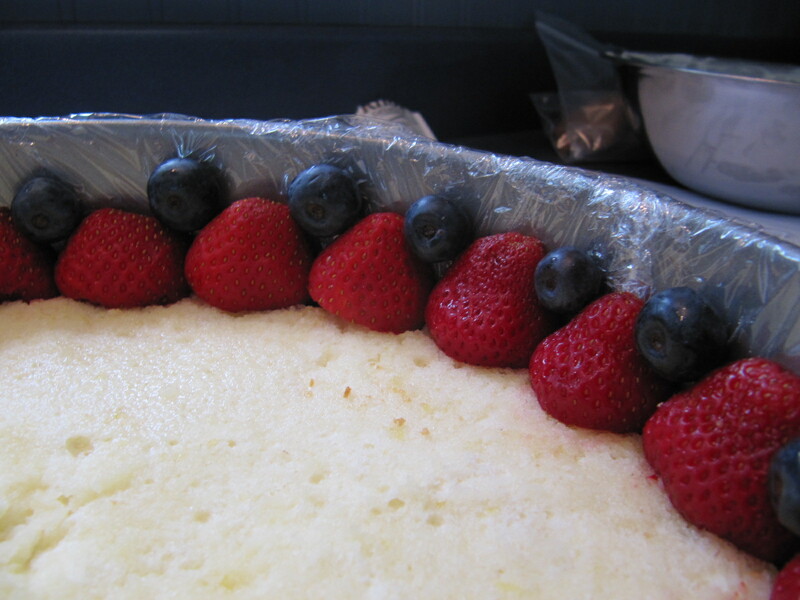 Hull and quarter your remaining strawberries and place them in the middle of the cake. 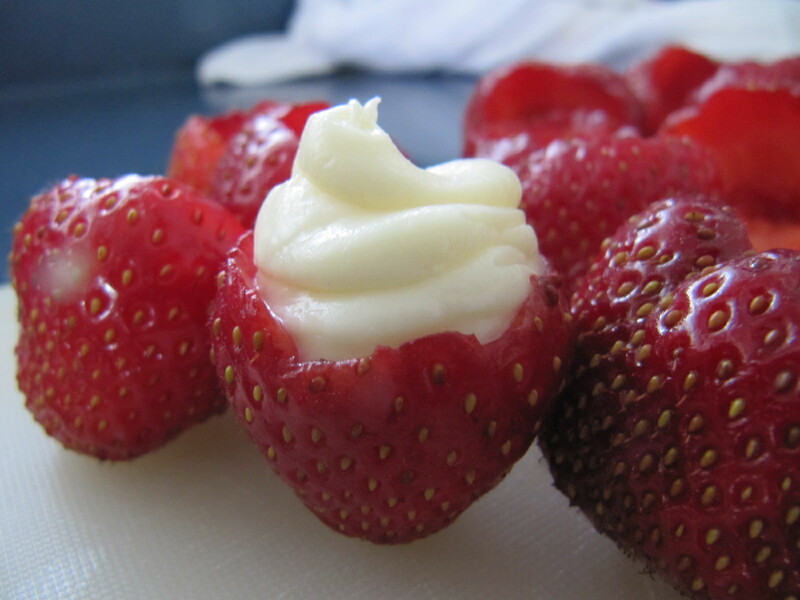 Cover the strawberries and entirely with the pastry cream. 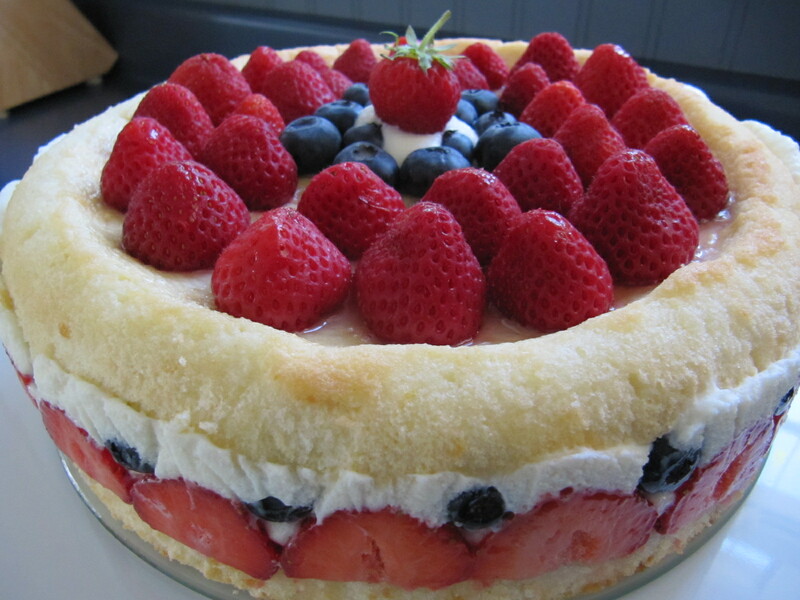 I chose to fancy it up a little and finished it off with the rest of the fresh berries. 8. Cover with plastic wrap and refrigerate for at least 4 hours. 9. 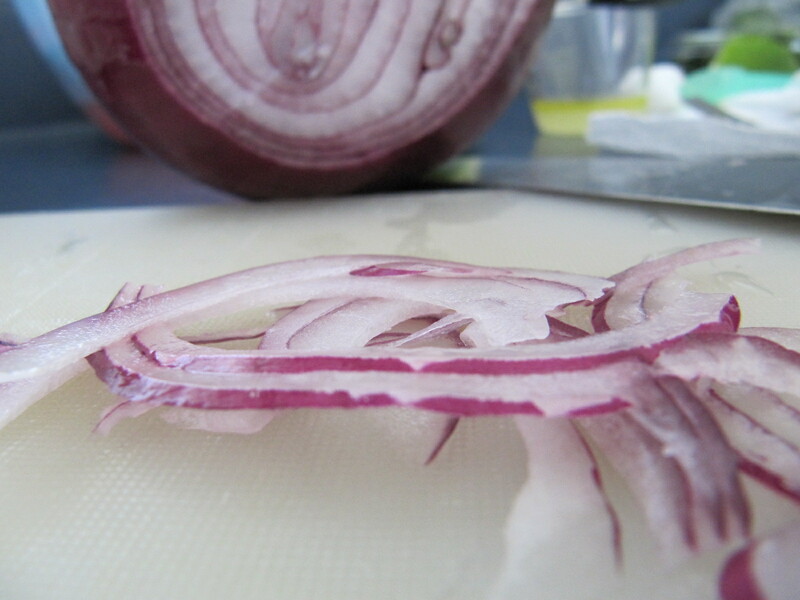 To serve release the sides of the spring form pan and peel away the plastic wrap. 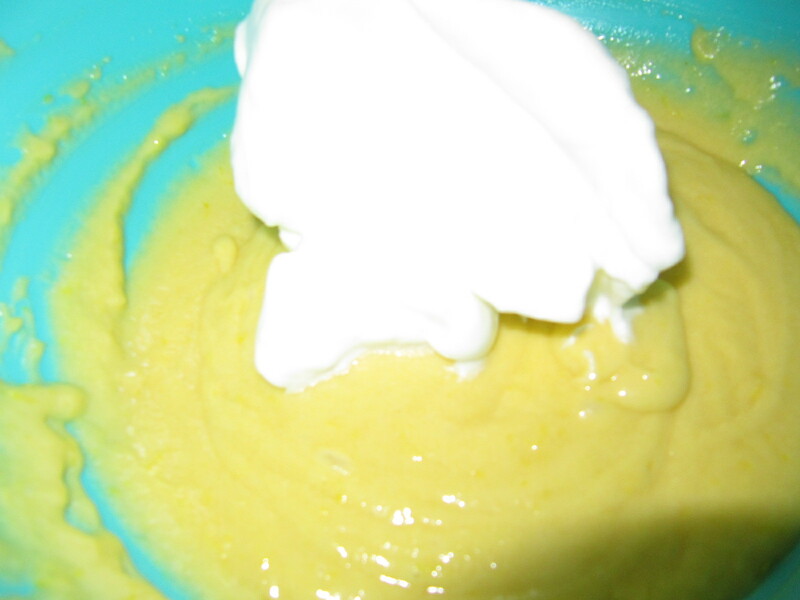 Serve immediately or store in the refrigerator for up to 3 days. Thank you Jana for a wonderful challenge. Our Fraisier was gone within 2 days. Everyone LOVED it. My parents who really aren’t dessert people had seconds. I will be making this again for sure!